Thanks to the awesome holiday party committee for a great morning of fun, games, food an laughter. 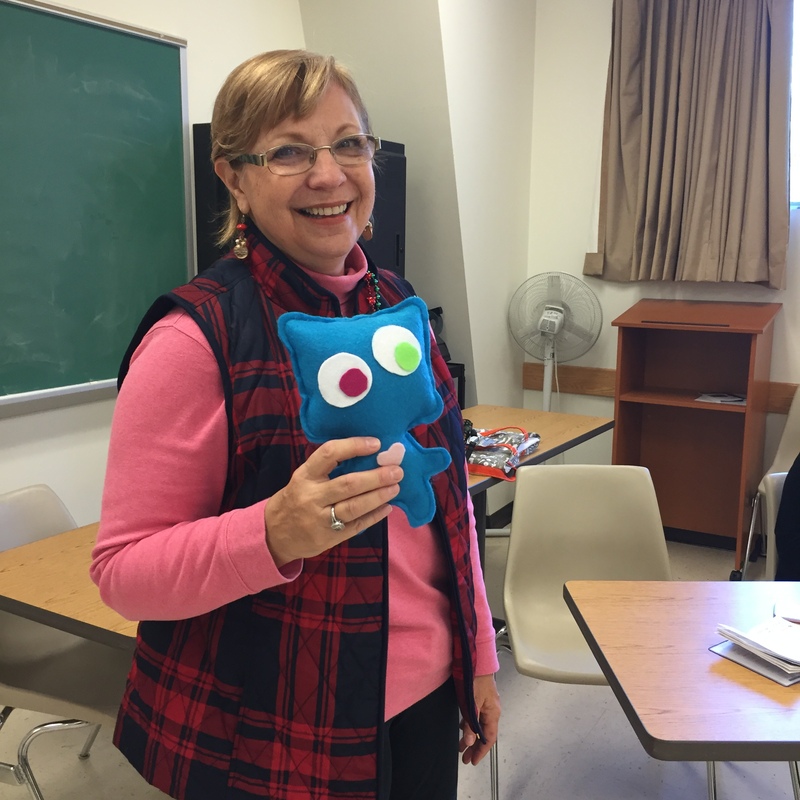 I’m sure all the members will agree that Sandy won the most coveted yankee swap item – a tree that sings and lights up! 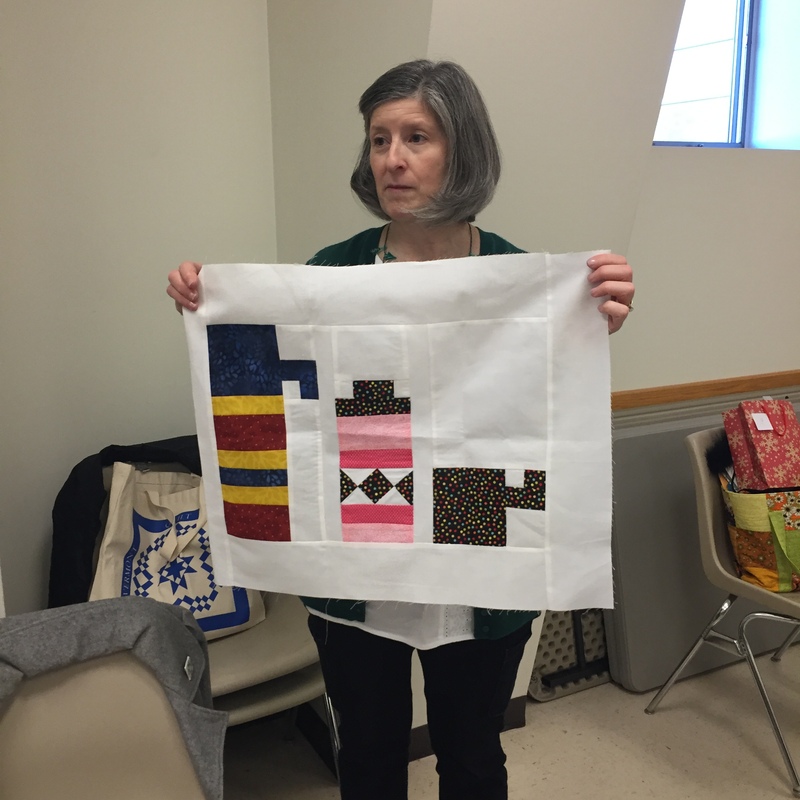 Julie showed us how she took an art quilt and transformed it into a t-shirt, and into a graphic on sneakers. 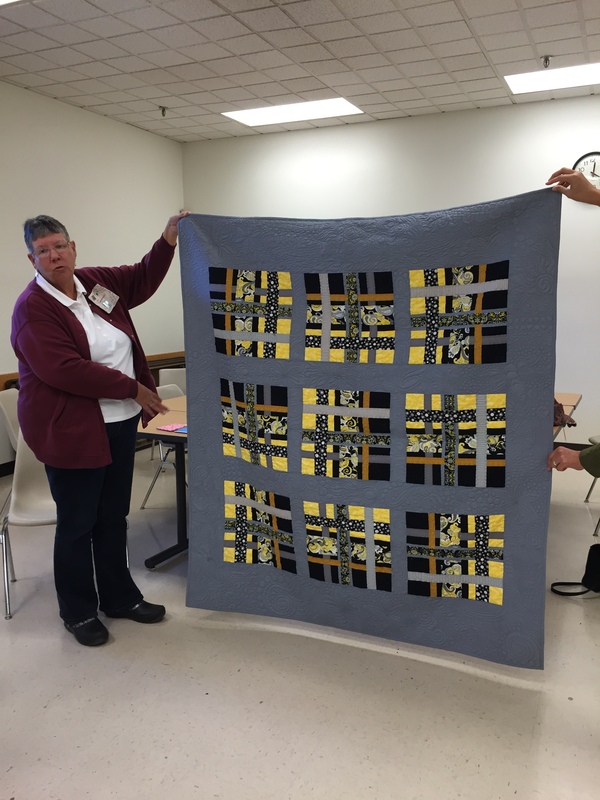 We’re submitting a quilt to QuiltCon, which is the show hosted by The Modern Quilt Guild. 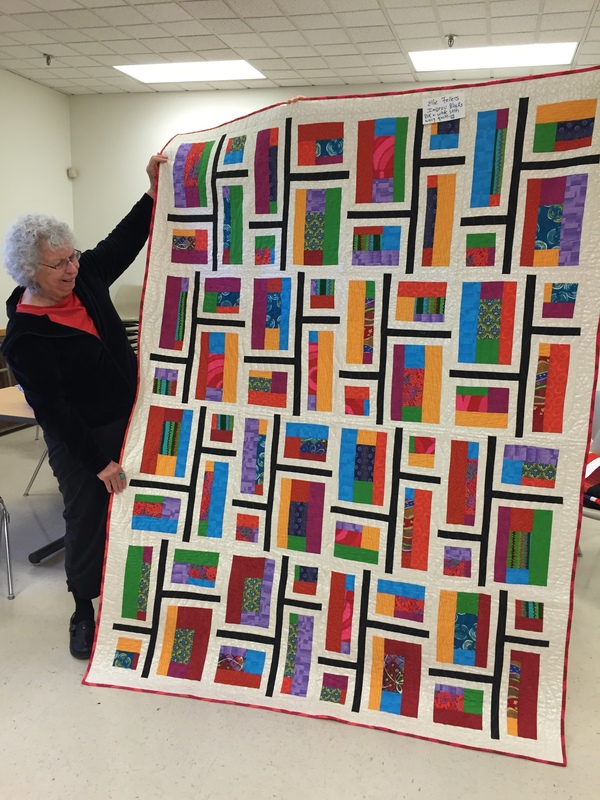 Almost all the members worked on some aspect of the quilt, and it was quilted by Betsy Canaan. 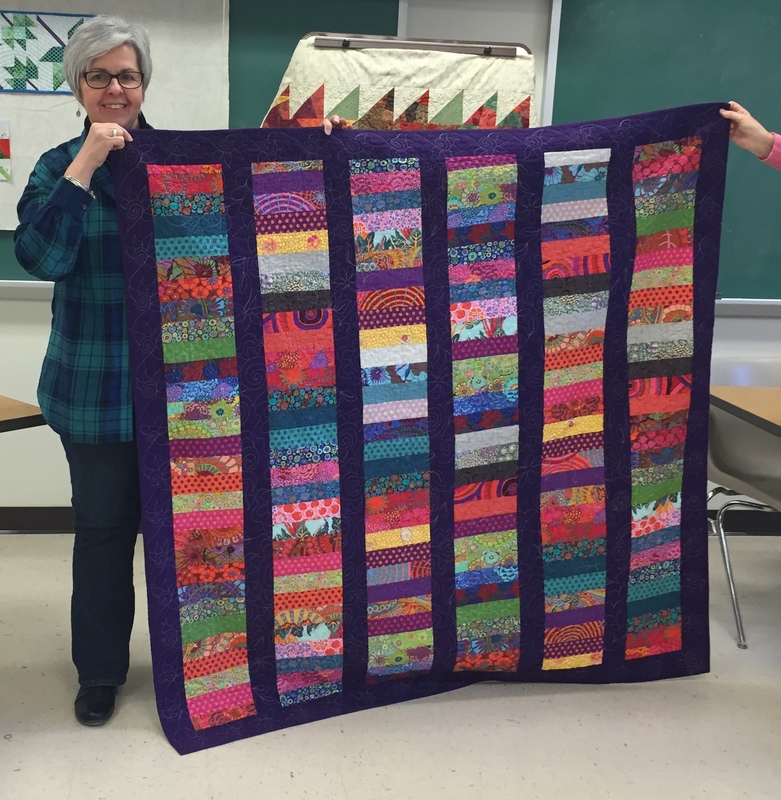 We voted on a name and Striation Gyration is the winner! 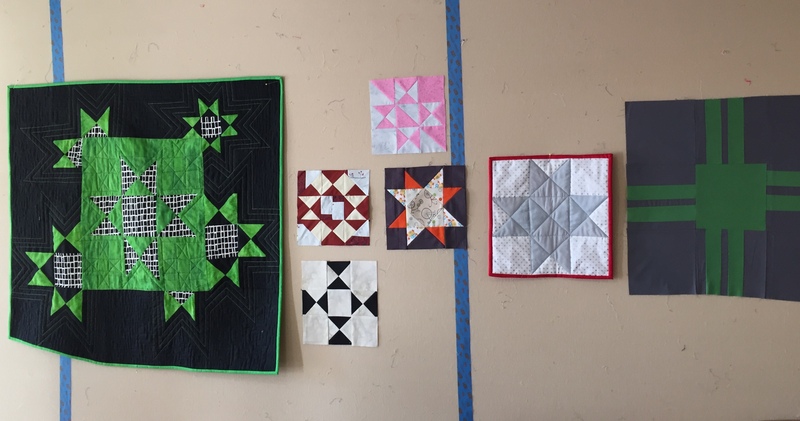 From the top, left to right: Evie, Hazel, Kate, Margaret, MaryAnn, Peg, and Rose. 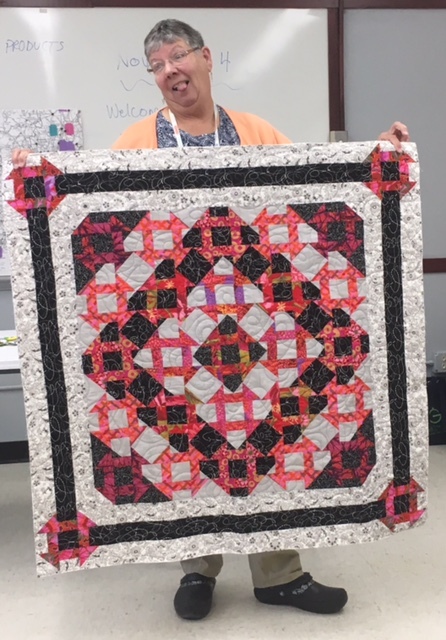 We had a great meeting using up our scraps! 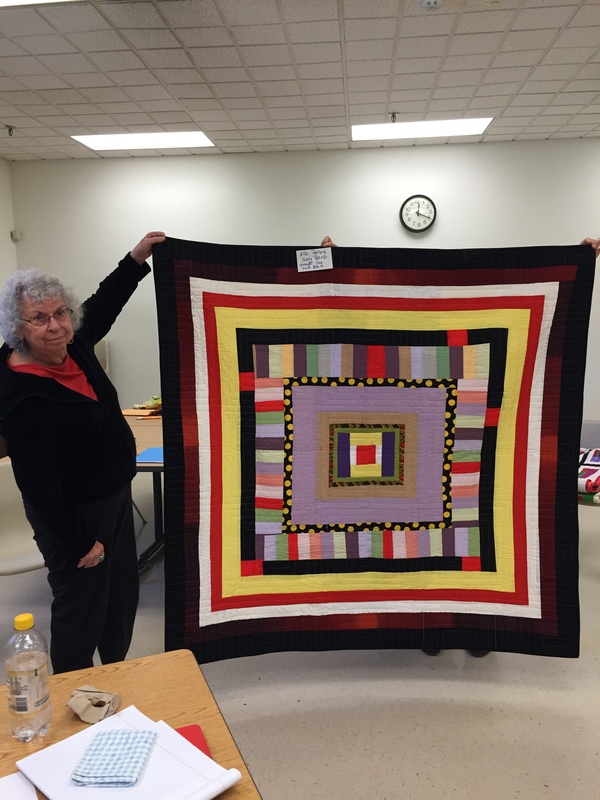 All quilts are “made” fabric – but some more than others – think crazy quilts, quilts made from worn items such as the Gee’s Bend Quilts, quilts made from feedsacks….. We also discussed ways to re-purpose UFO’s that we would rather never see again including finishing them and donating them to a charitable cause, or re-purposing them into something you LIKE – don’t limit yourself to quilts – think skirts, placemats, pillows. 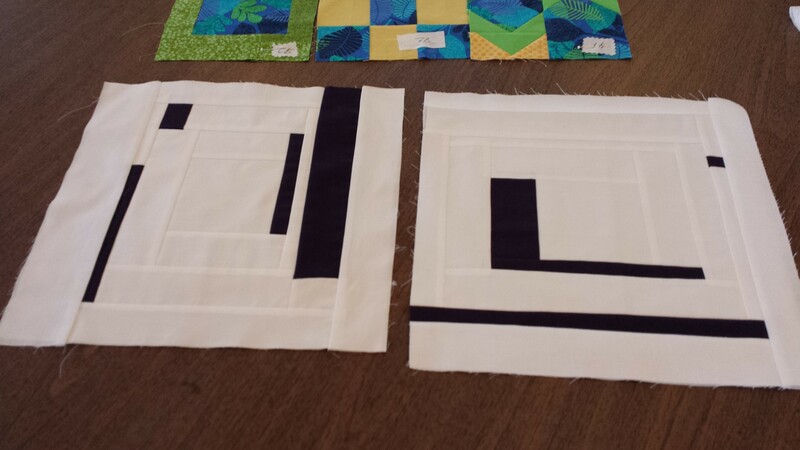 Maybe you adopt a hawaiian applique pattern for that holiday top – or make that solids melange into 6″ squares with vertical bars in -between set on a white background… we referred to Mary Kerr’s Twisted for inspiration. Show and Tell! 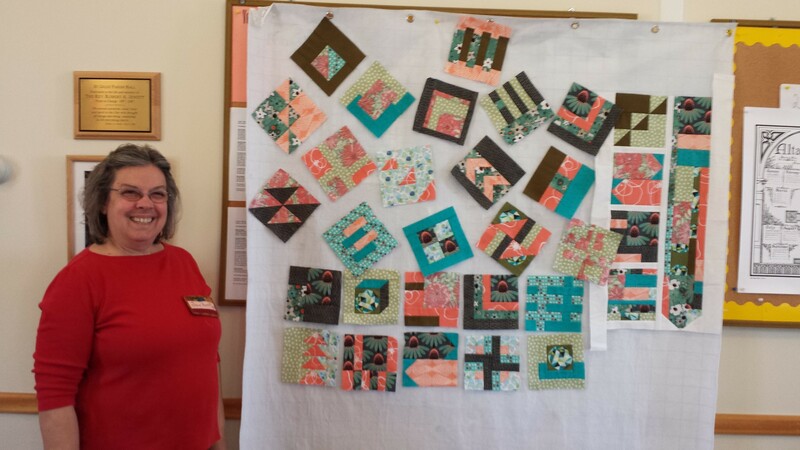 Linda and Karen with their pieces from a previous curves workshop; Sandy’s stunning blue quilt; Dina’s excellent Big Stitching; Leanne’s EPP; Bonnie’s antique shop treasure made in the 1950’s; Karen’s Mariner’s Compass; Ellie’s pink quilt; Dan with placemats and belt made with scraps; and Sue with her 2nd Poppin bag. Wowza! 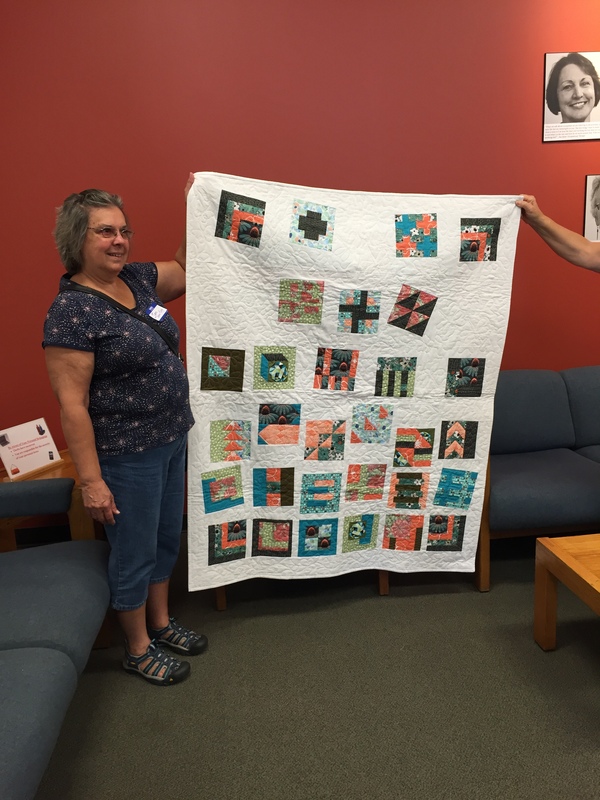 The Maine Modern Quilters are in AWE of the love and support shown to us at our first ever Modern Quilt Expo. Thank You, Thank You, Thank You!!!! 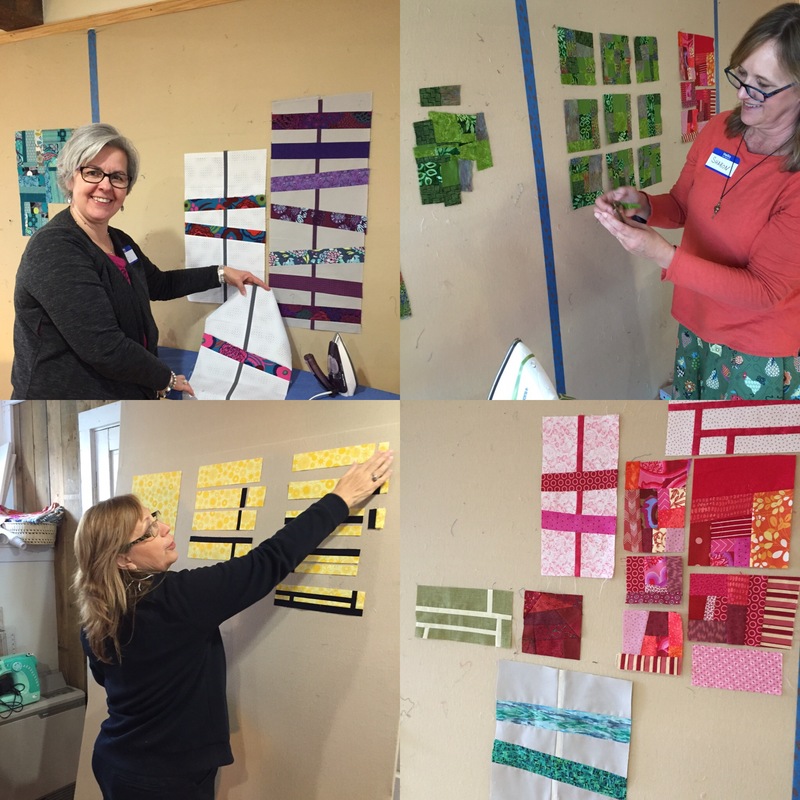 We had so much fun planning the event, and it was so much fun to talk to the 200-ish guests that visited about modern quilting. A photo retrospective is below. 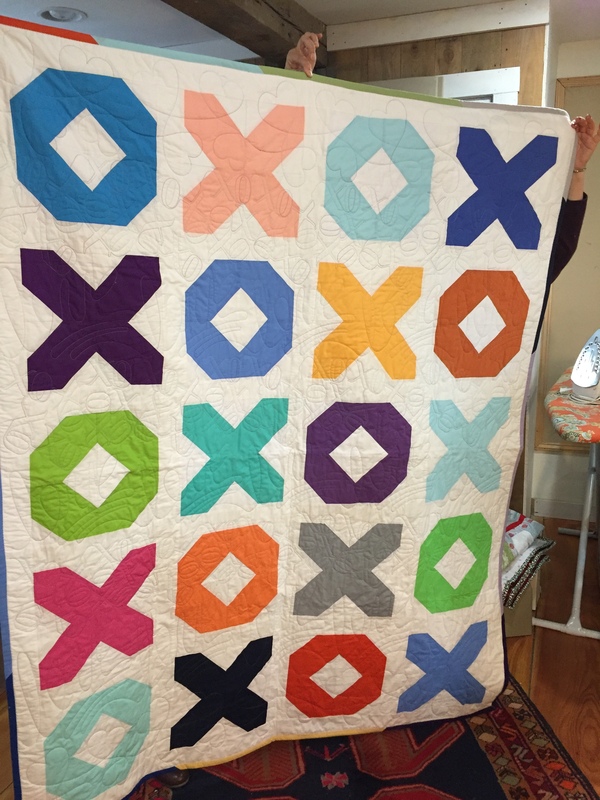 We are hoping you can swing by this Saturday, April 7 for our very first Modern Quilt Expo. It will be held at the First Congo Church on 19 Gloucester Hill Rd. New Gloucester, Maine. 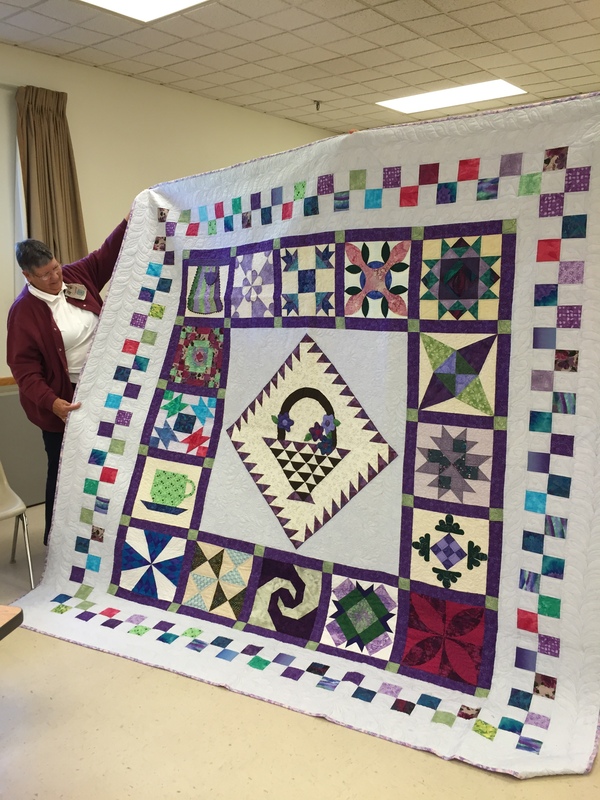 It will be very casual and fun – We will have approximately 60 modern quilts on display, and the demonstrations will be on how modern quilters are using hand quilting, paper piecing and improv curves. Each demonstration person will be at a table, and will engage in one-on-one conversation/ demonstration or small group conversation/ demonstration as people wander through. 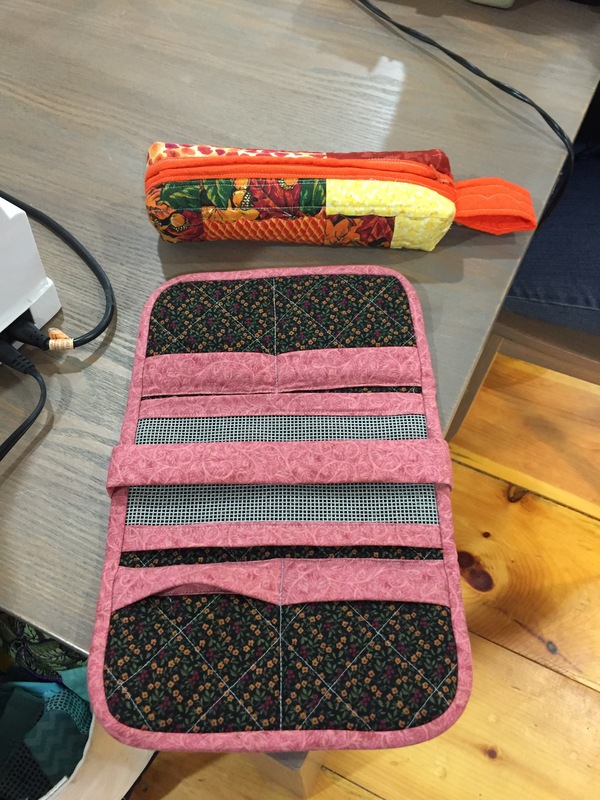 The make-n-take is a modern potholder – ha ha – exciting, right? 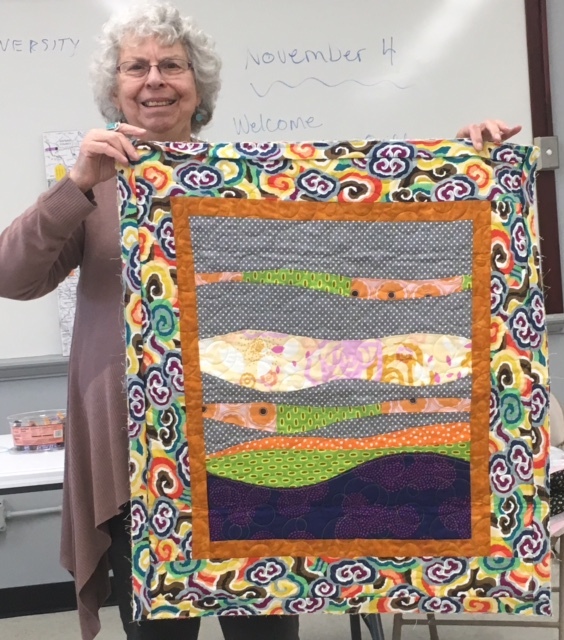 You must admit though, it is a project that can be completed in a short amount of time, and is appropriate for all ages, and… have you looked at your potholders lately? It might be time for a spring cleaning…. We have an excellent raffle item. One of those very cool collapsible wheeled carts. 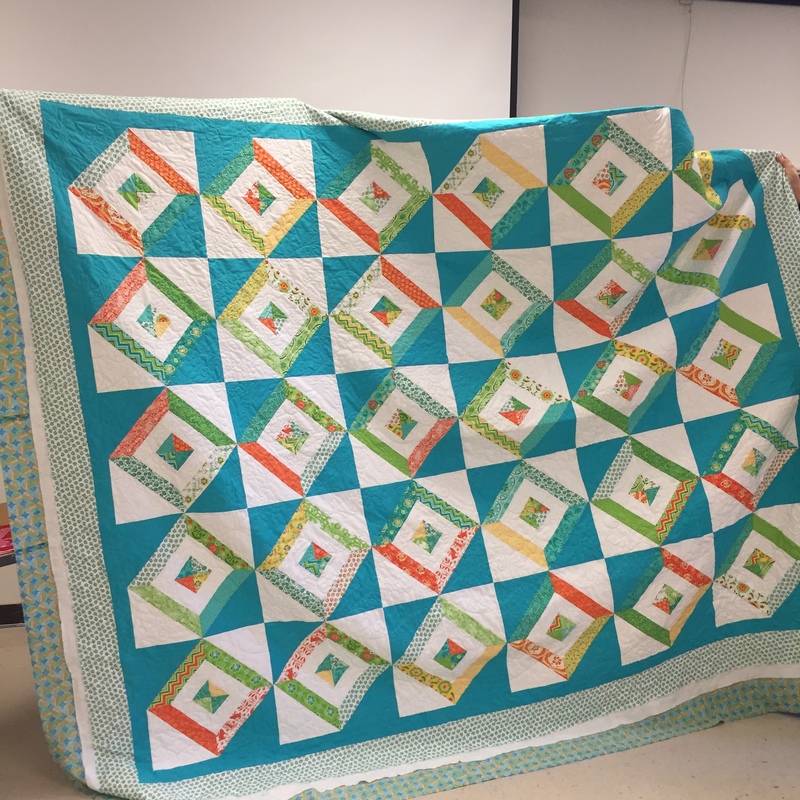 Through the generosity of Quiltessentials, Alewives, Missouri Star, and Studio E Fabrics, there are also some great items IN the cart. 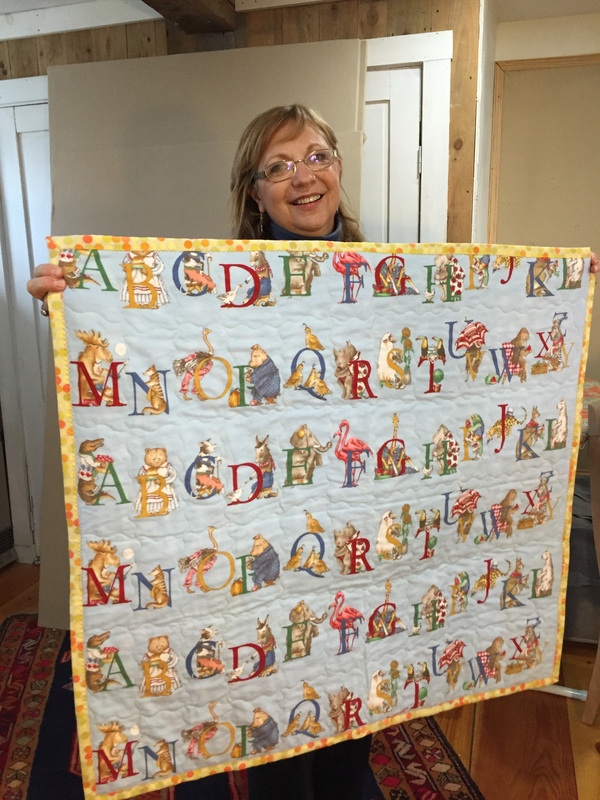 If you are participating in the Maine Shop Hop, we are a nice stop on the way to Quiltessentials in Auburn, Oxford Mill End Store in Oxford, and Sew Orchid in Norway. 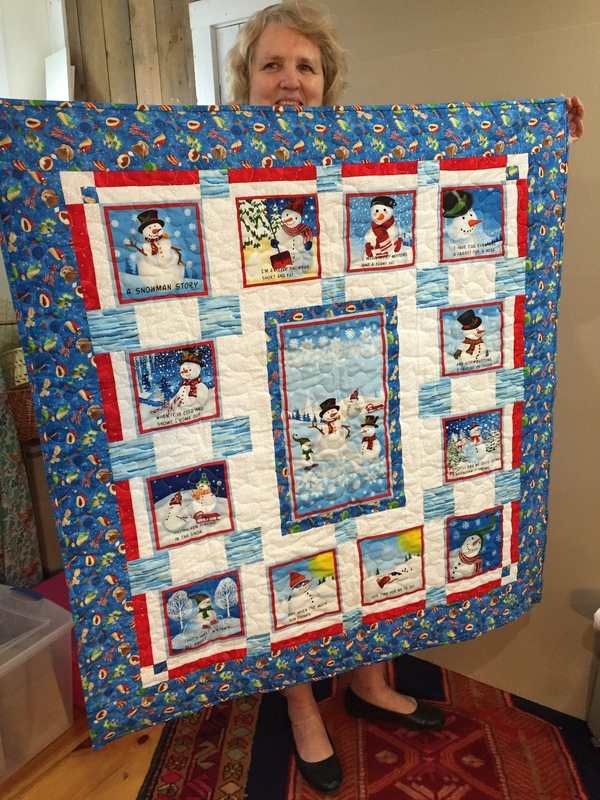 If you are looking for well priced home dec or marine fabrics, The Fabric Warehouse in Auburn is also nearby. Have a terrific week and we hope that you can drop in on Saturday! 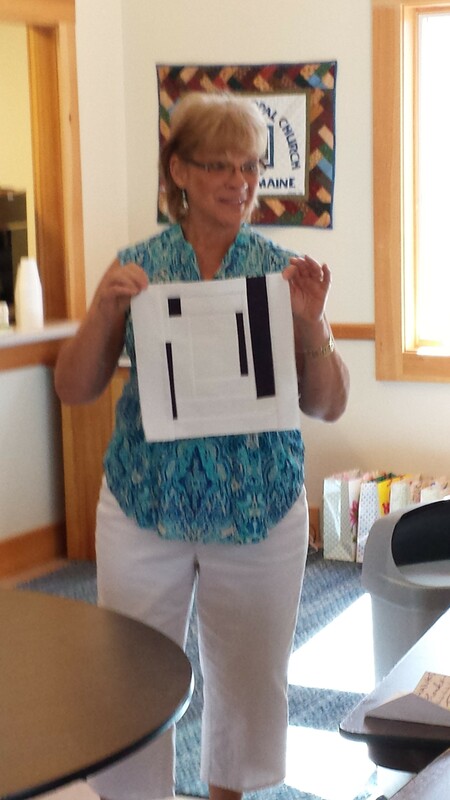 Thanks to member Sue Arnold, we had a terrific time learning how to make marks on fabric printing with gelli plates! 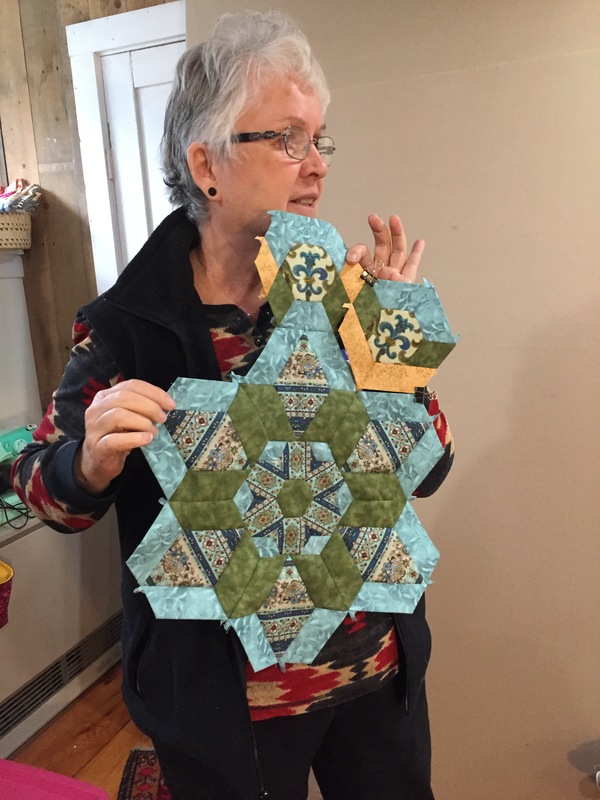 And of course, a few snaps from member show n tell. Members! 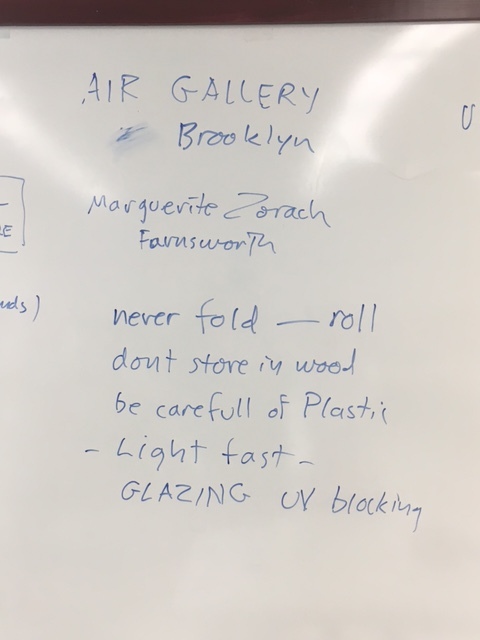 I am sorry if I didn’t get a snapshot of your project! 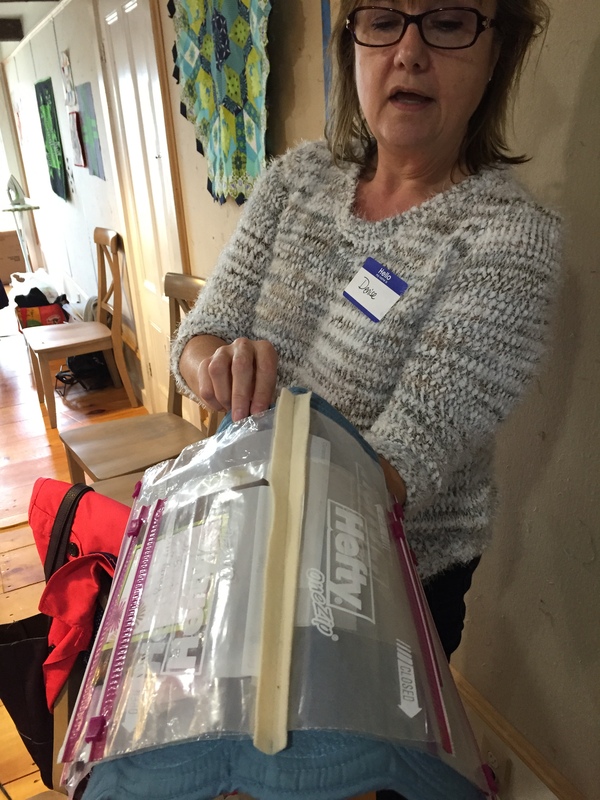 I was busy sorting space heaters and the fuse box…. We celebrated the holidays on December 2… as you can see by the photos, we hardly had any fun at all… of course, not everyone can make every meeting – but we managed to get a snapshot of the party-goers as depicted above! Games… the competitors were FIERCE!!!! 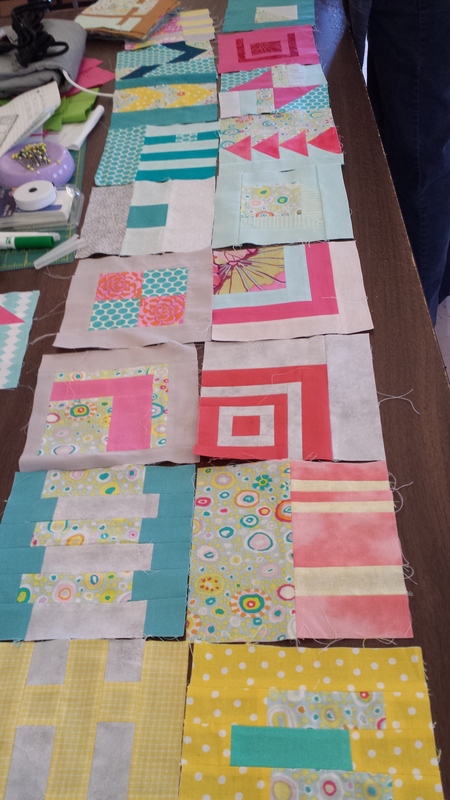 Evelyn won the Big Pile of Fat Quarters….she rolls a mean dice…. 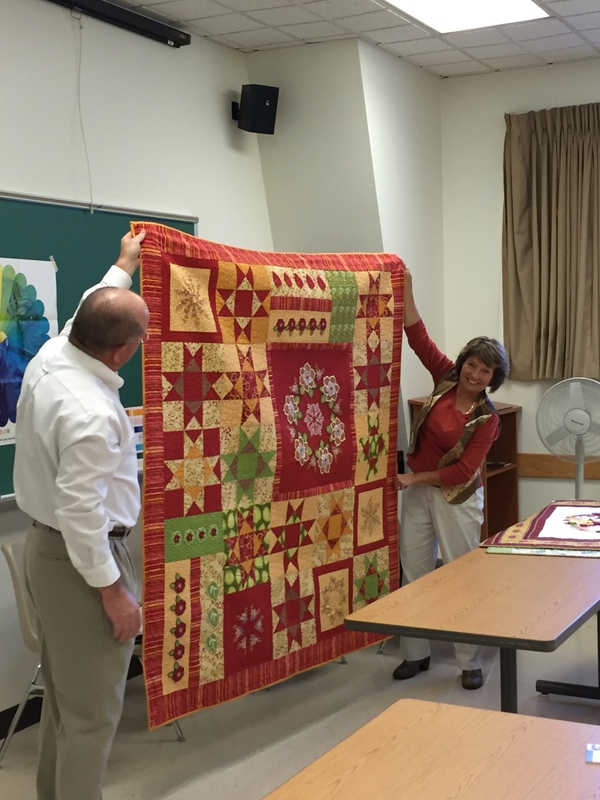 Thank you visiting artist Kevin Callahan for a terrific presentation about fiber, textiles and fabric in fine art. 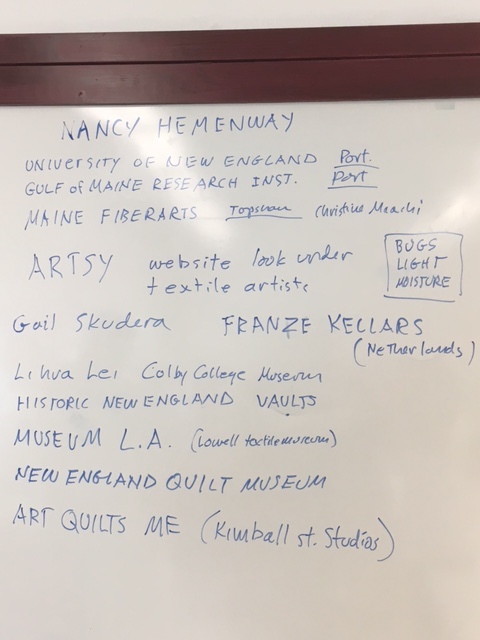 View the work of Nancy Hemenway Barton at the UNE gallery in Portland through December 20. 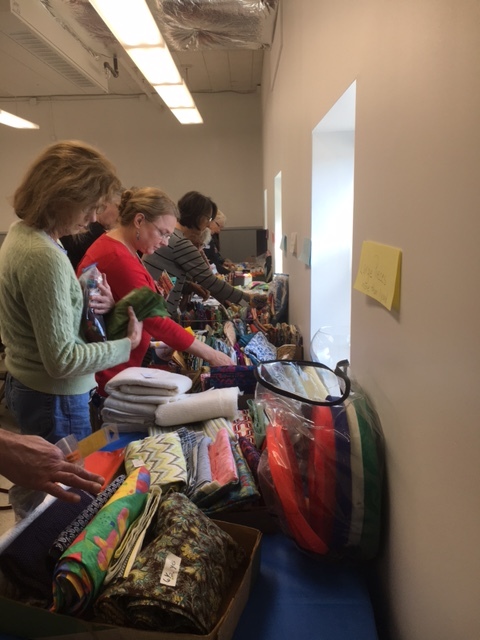 We commenced with our annual fabric, books and notions fundraiser after Kevin’s speech, agreeing to “be adults” and not fight over the goods…. 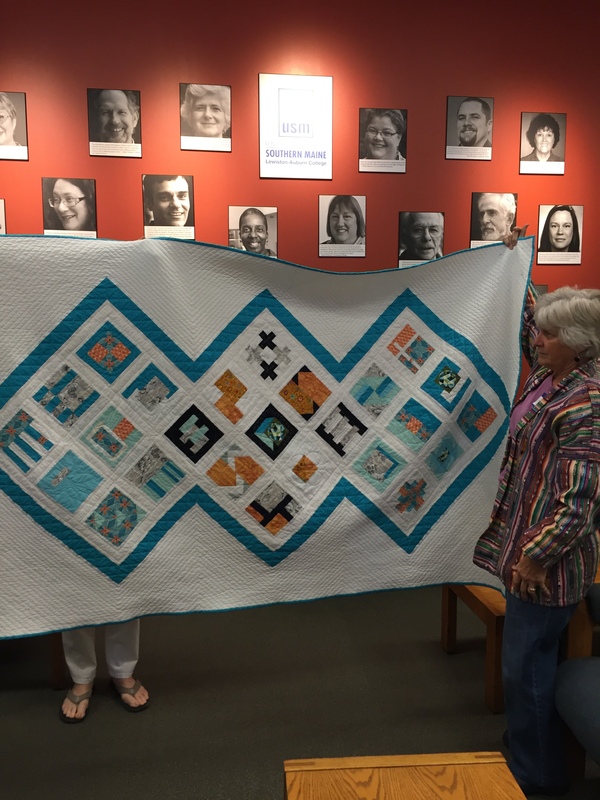 Thank you Betsy Cannan! We had a glam-clam day with Betsy leading the charge. Check out these great glam clam beginnings! We started off the 2017-2018 year with a great meeting at the Buker Center in Augusta featuring our own Kathryn Simel. 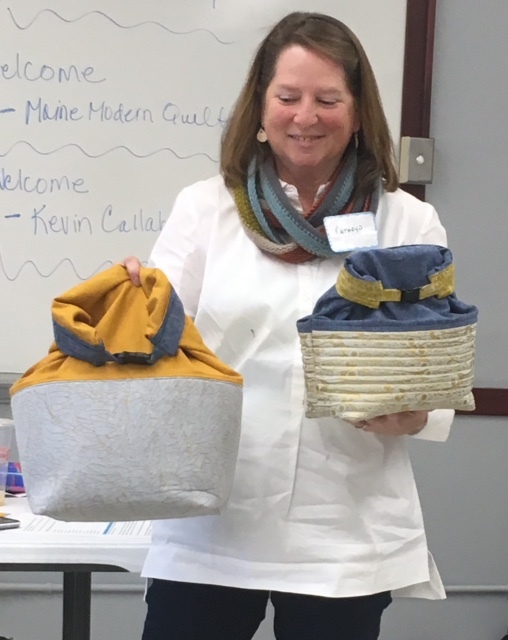 She gave a very inspirational talk and trunk show about her design process, Inspiration to Execution. 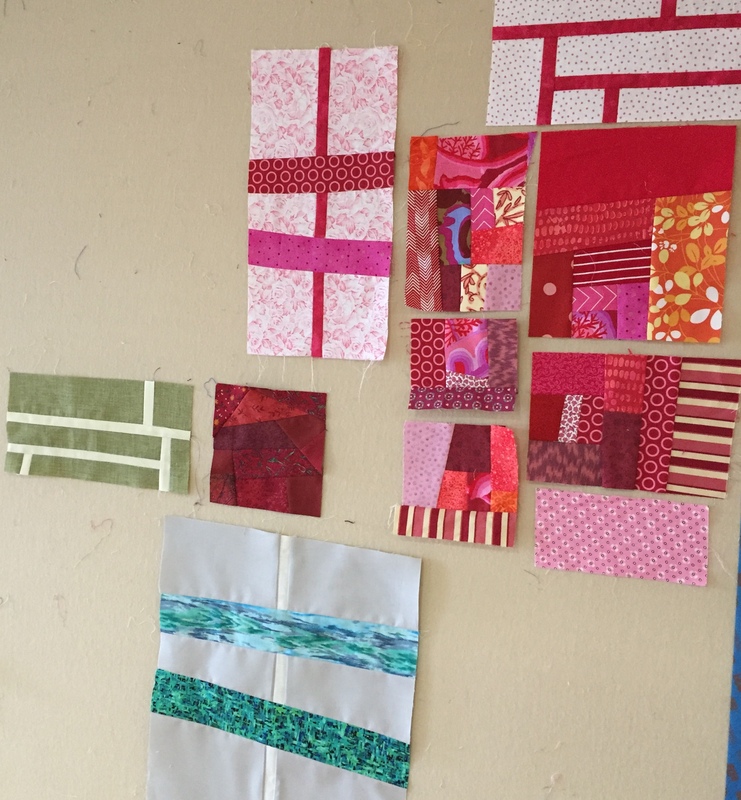 There were many beautiful pieces for Show and Tell. People had been very busy over the summer break! 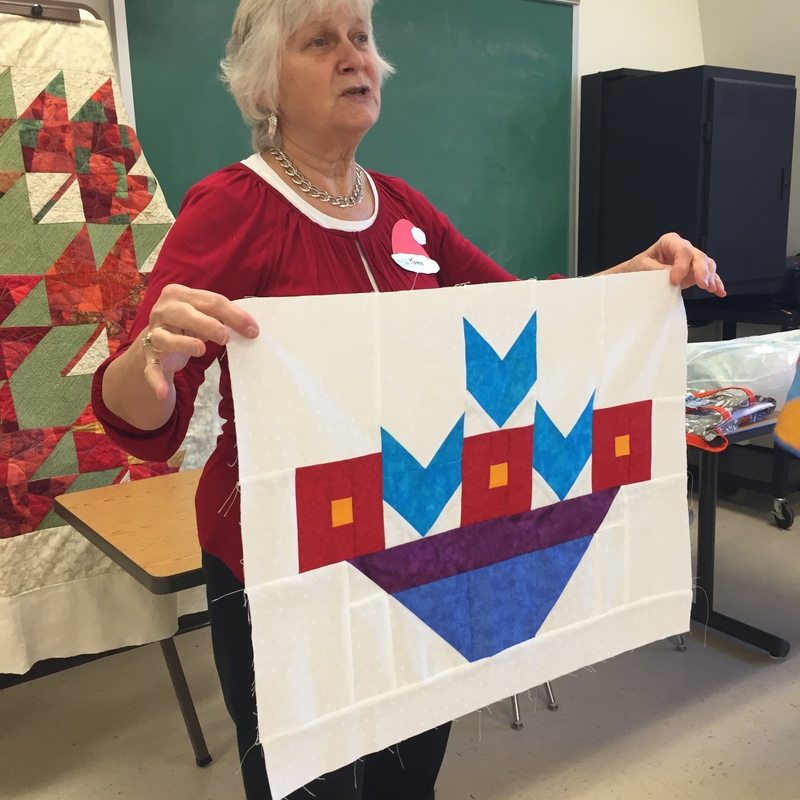 Our last guild meeting of the year was held in New Gloucester at the First Congregational Church. 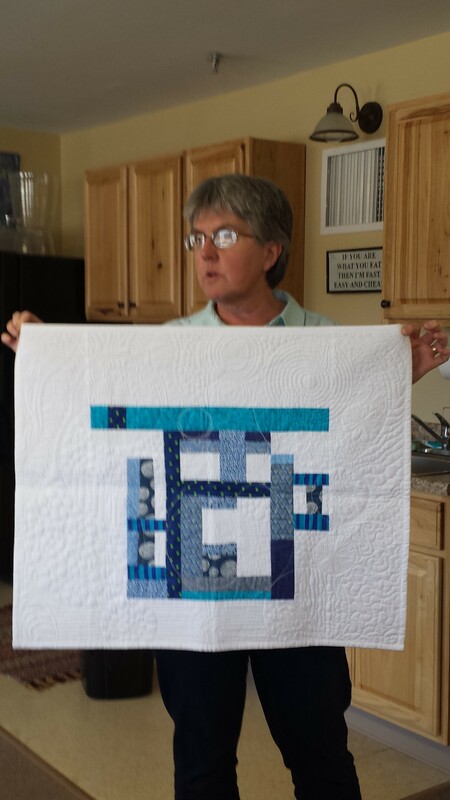 Sue Arnold finished up the Block of the Month series. 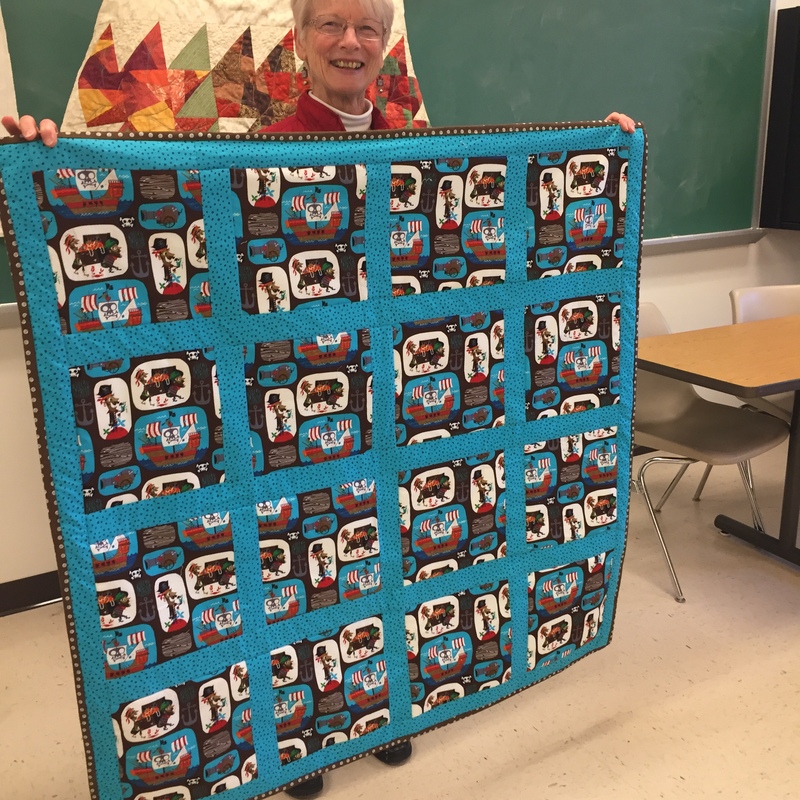 We are very appreciative of all the hard work she put into organizing that activity for the guild. The highlight of the meeting was the Improv Round Robin activity. 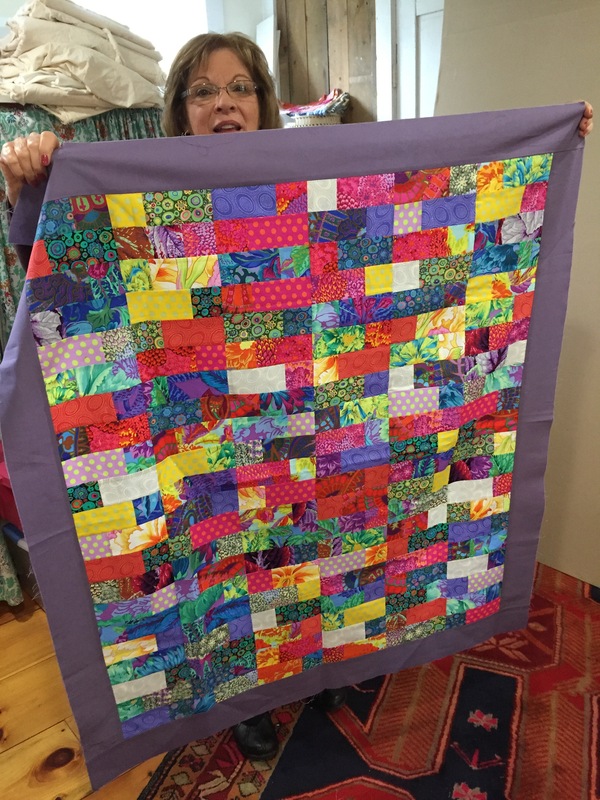 Members had a chance to really stretch their creativity and use their improvisational quilting skills to the max! It was great fun and a wonderful way to end our guild year. 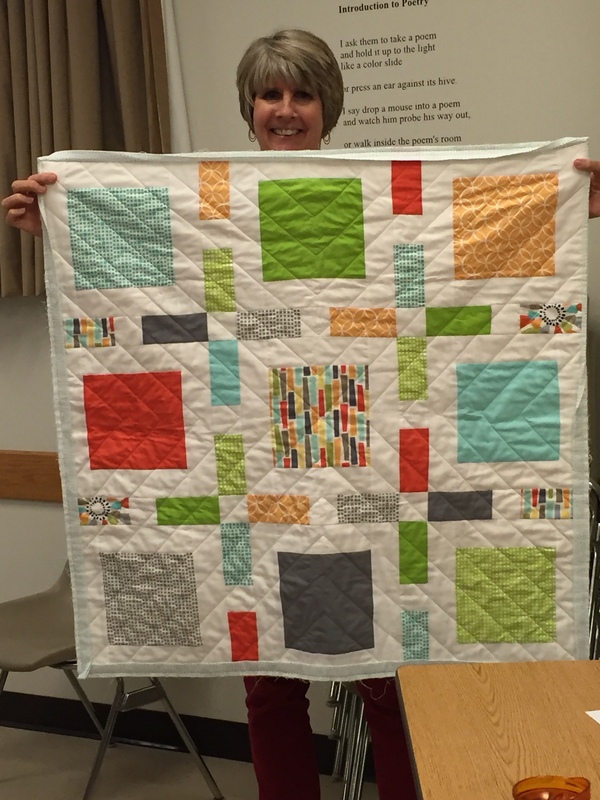 Thanks to all who made this a memorable year of Modern Quilting! 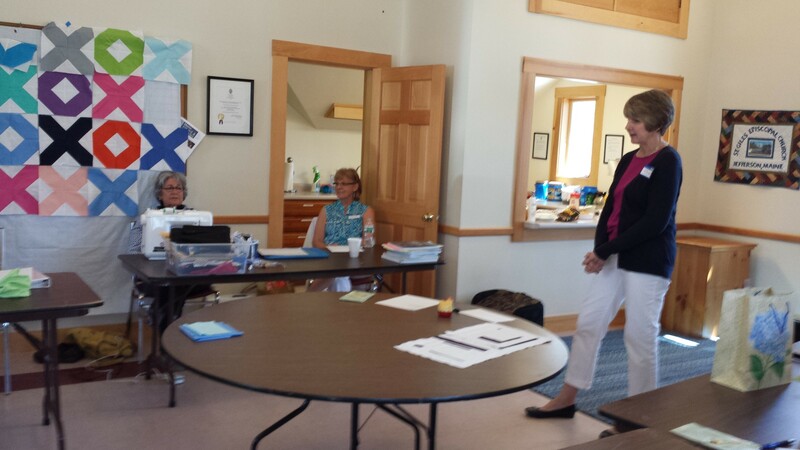 The meeting was held at the First Congregational Church in New Gloucester. 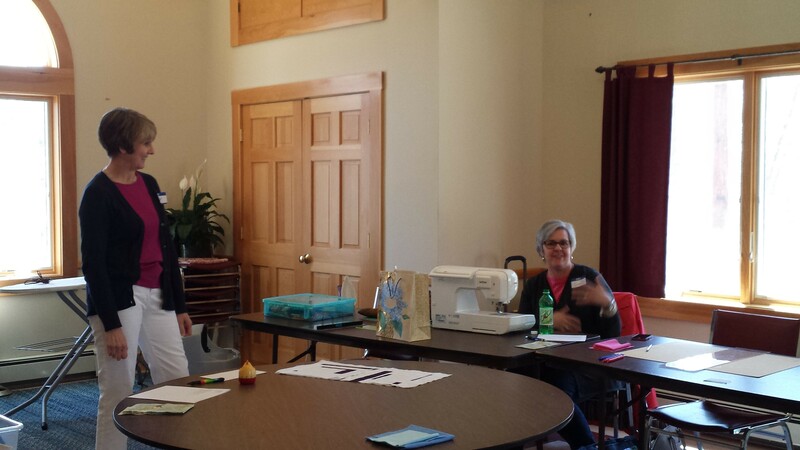 It was not a sewing filled meeting but we shared alot of information about upcoming activities. 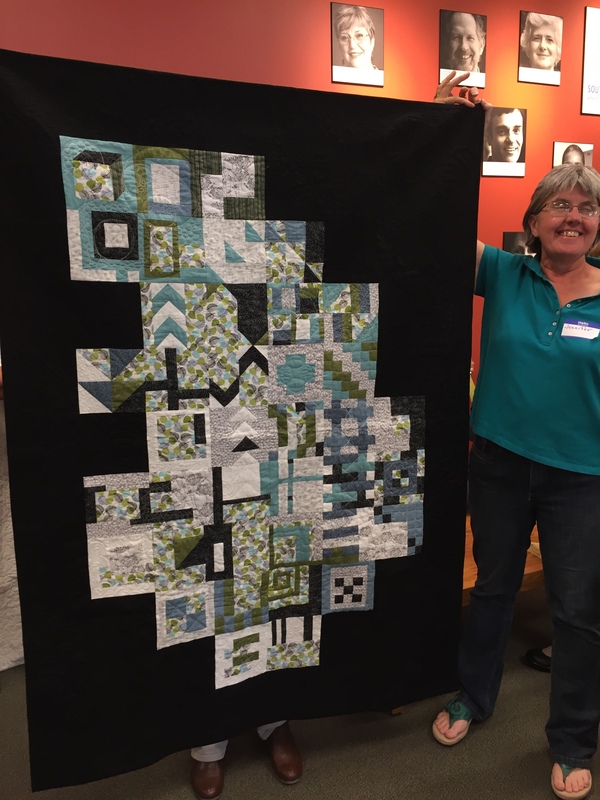 Sue Arnold did the Block of the Month, we discussed the guild banner, the upcoming Improv Round Robin was explained and we had an incredible Show and Tell. 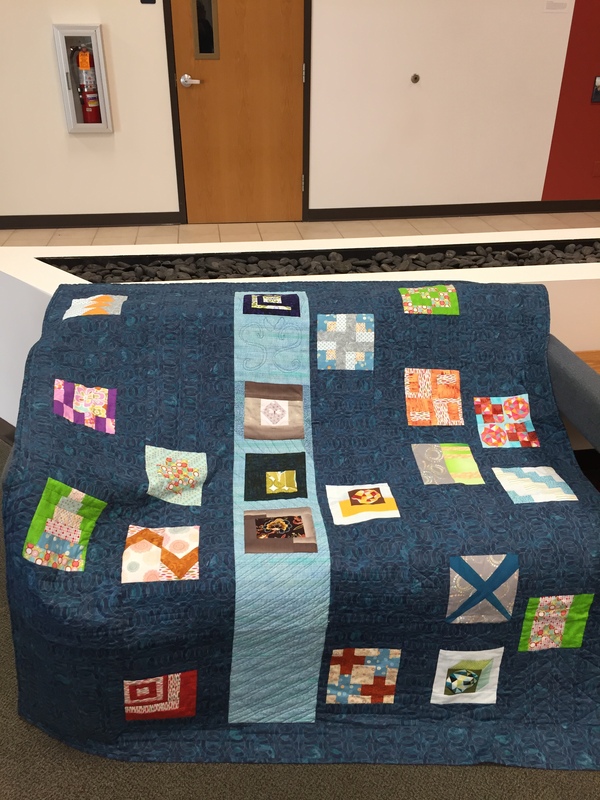 I think people had been working diligently to finish up projects! The meeting was held at the Auburn Public Library. 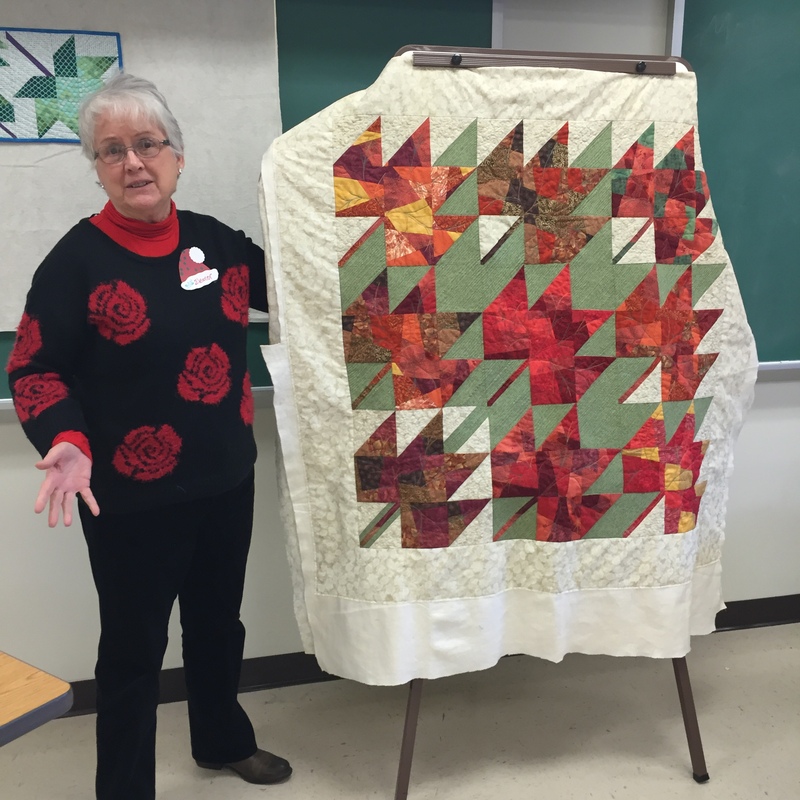 Jane and Karen showed how to do a landscape quilt to an enthusiastic group. 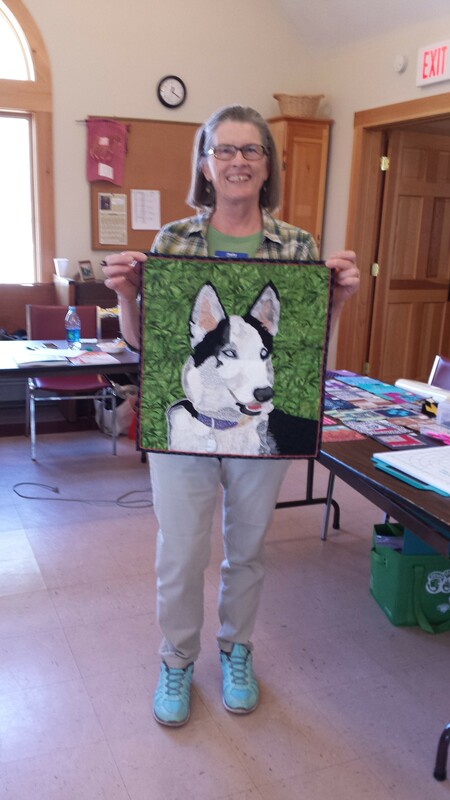 As usual, several people showed beautiful quilts at the Show and Tell. 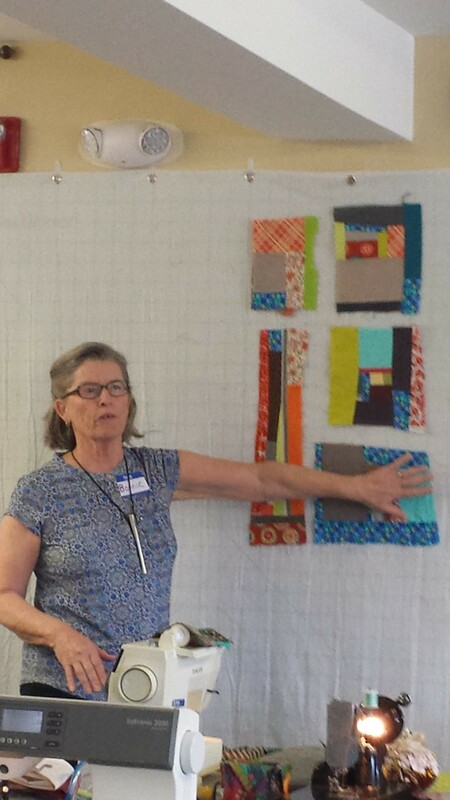 Jane provided instruction and education on doing a landscape and and abstract quilt. 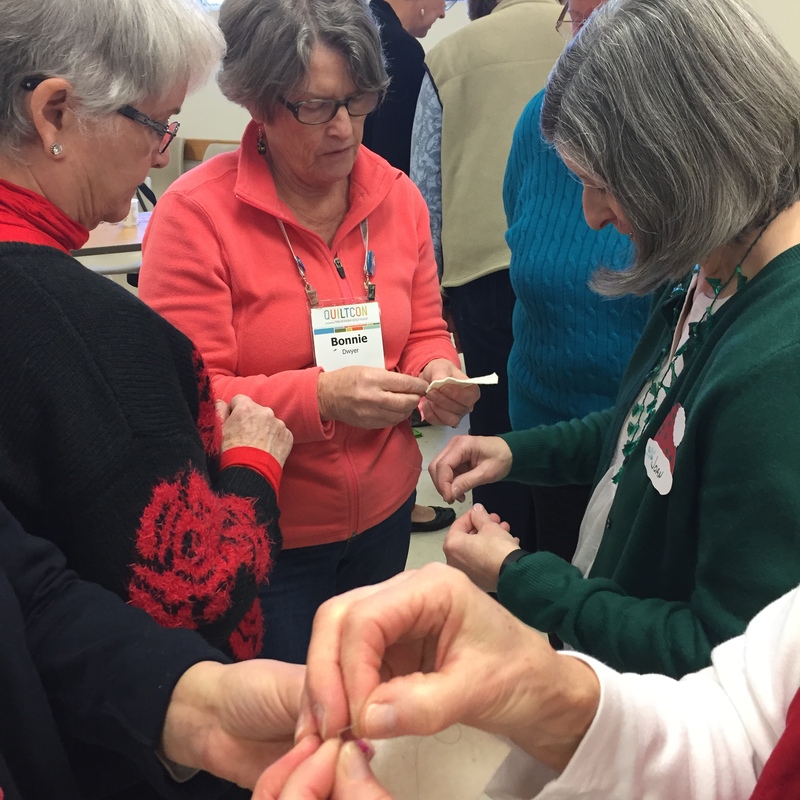 Sue Duval will lead us in an improv round robin – meeting will be in the vestry of the 1st Congregational Church at 19 Gloucester Hill Road in New Gloucester, Maine. 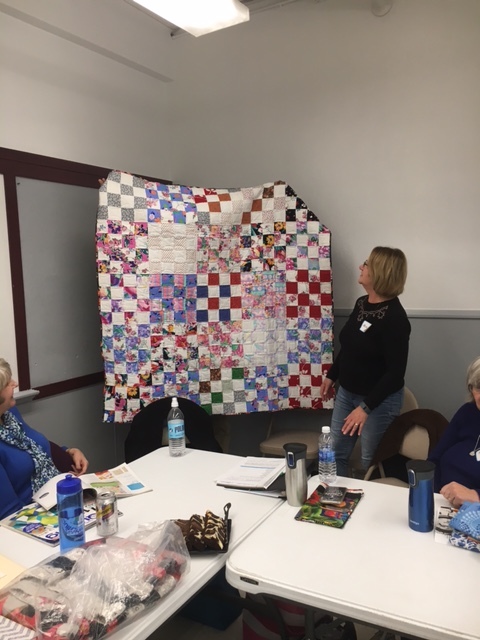 We had a very lovely venue for this meeting in Westbrook and the weather cooperated, allowing us to have a great turn out of members. 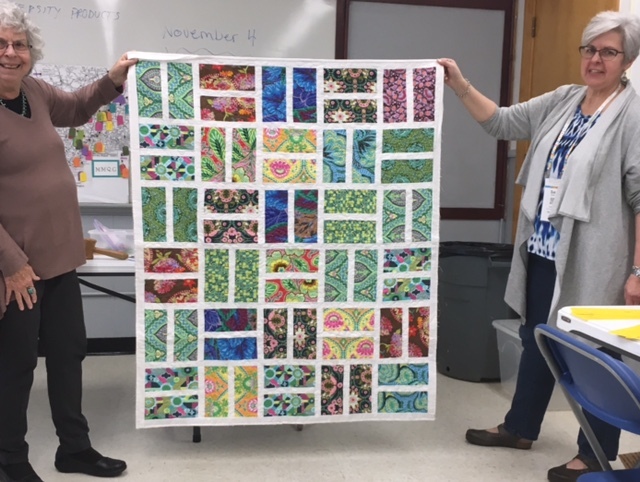 As we introduced ourselves, I asked people to share their favorite aspect of quilting and their least favorite part of quilting. It was a nice way to get to know each other better and generated great discussion. 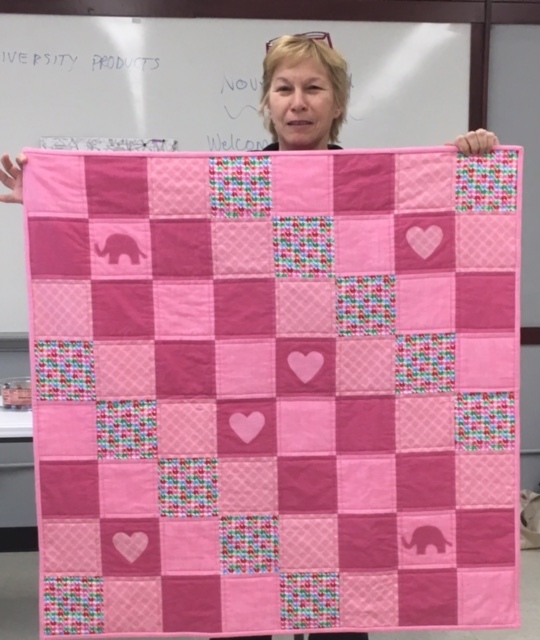 Sue Arnold led the Block of the Month presentation. 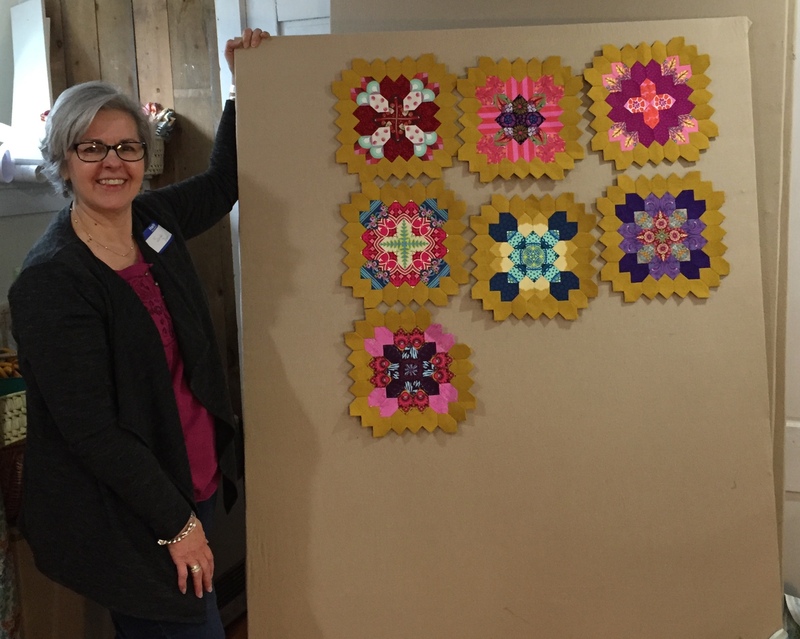 Here is Bonnie and Anne-Marie showing some of the creative and beautiful blocks. 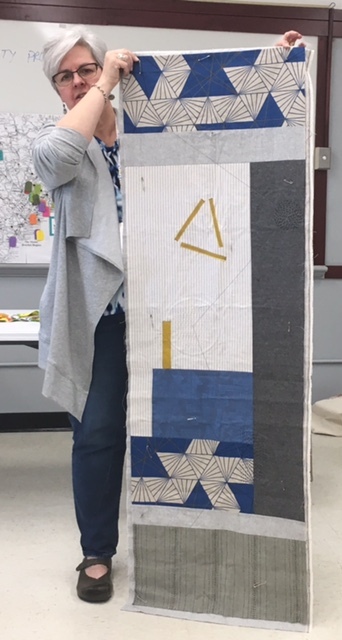 Kathryn Simel showed the design for the banner that our guild will display at Maine Quilts this summer. 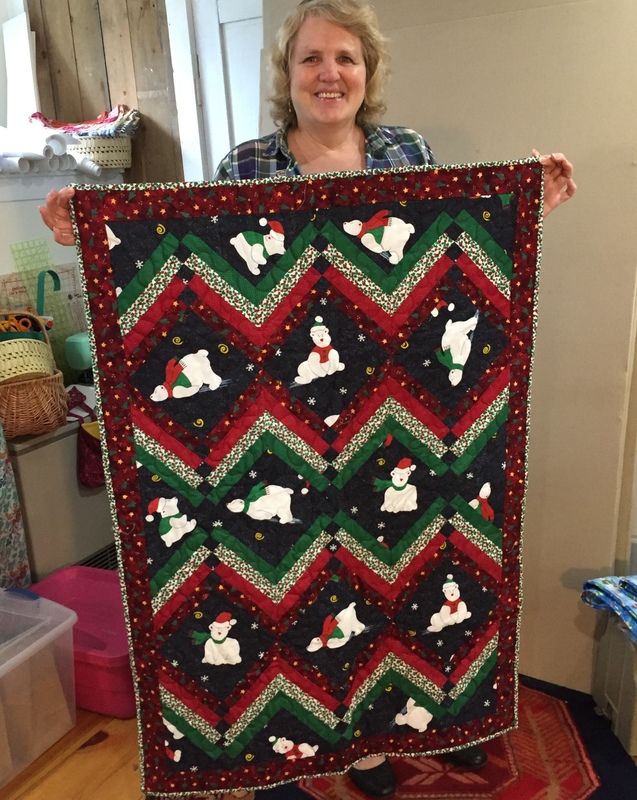 She did an extraordinary job designing and sewing it together. 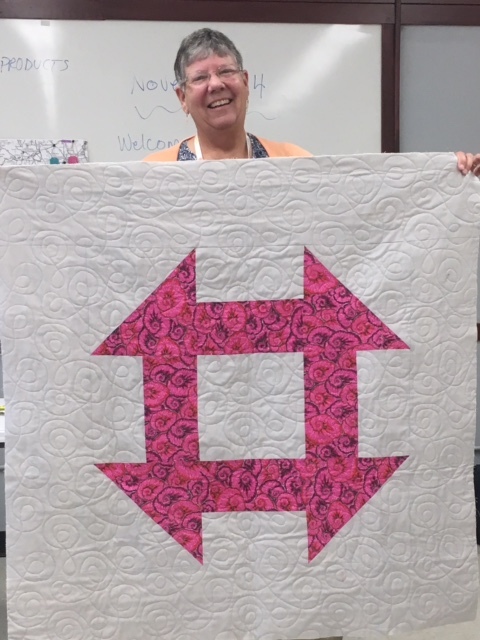 We are so fortunate to have this incredible designer in our group! 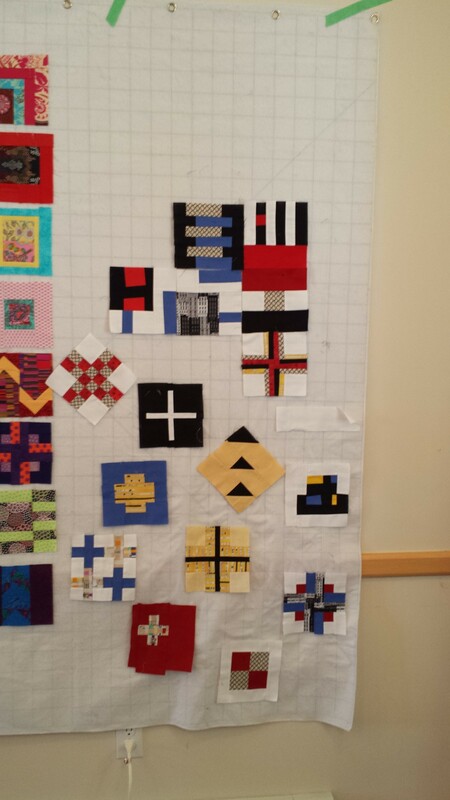 Other guild members will put some of the finishing touches on in. 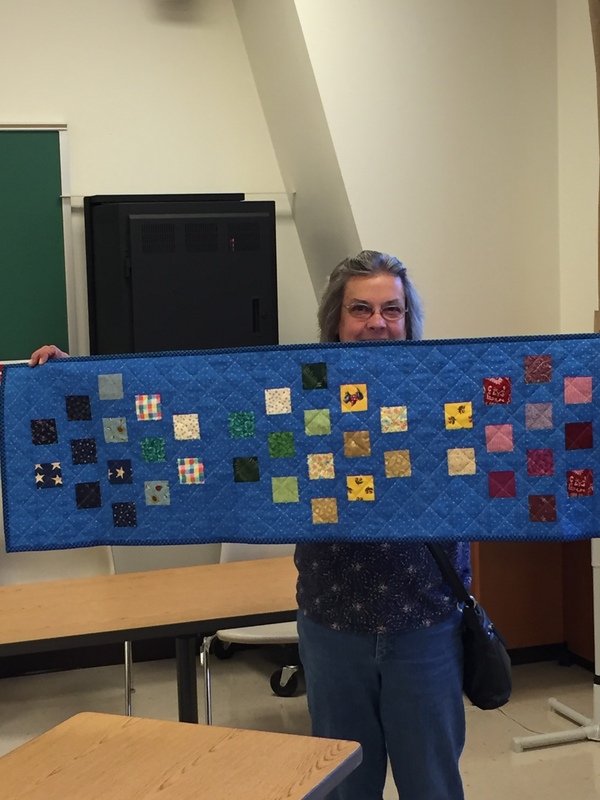 Thanks to all involved in this project! Carmen and Jane each gave demonstrations on binding techniques that were very helpful! 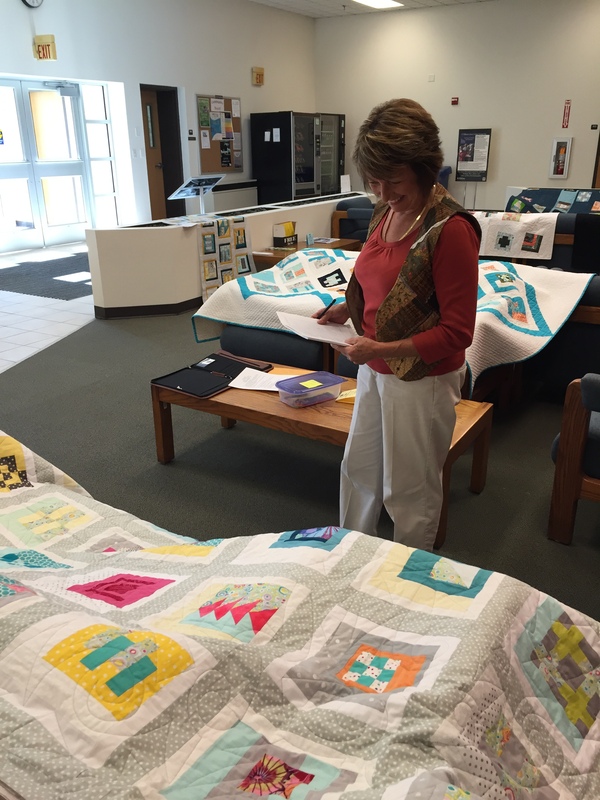 And we had a great showing of beautiful quilted items for Show and Tell! It was a cold but clear day for the first meeting of 2017. 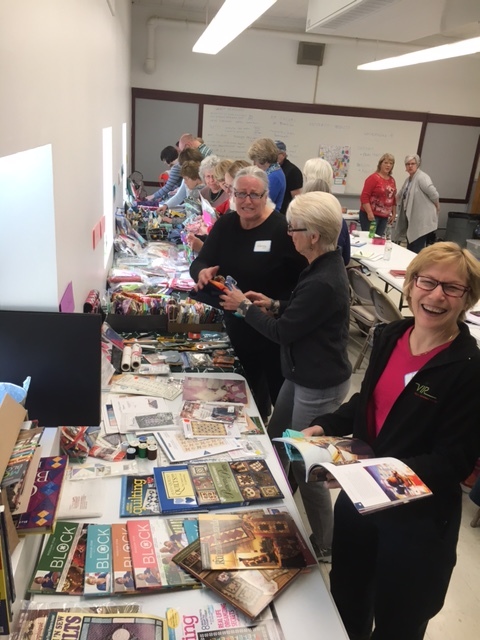 We had a very enthusiastic group with several new members in attendance. 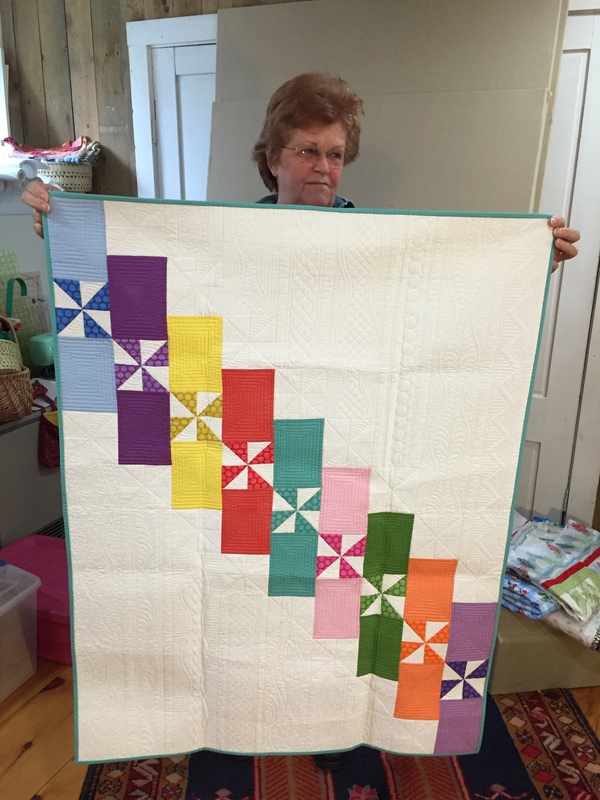 There were many creative versions of the Modern Pinwheel Block of the Month. 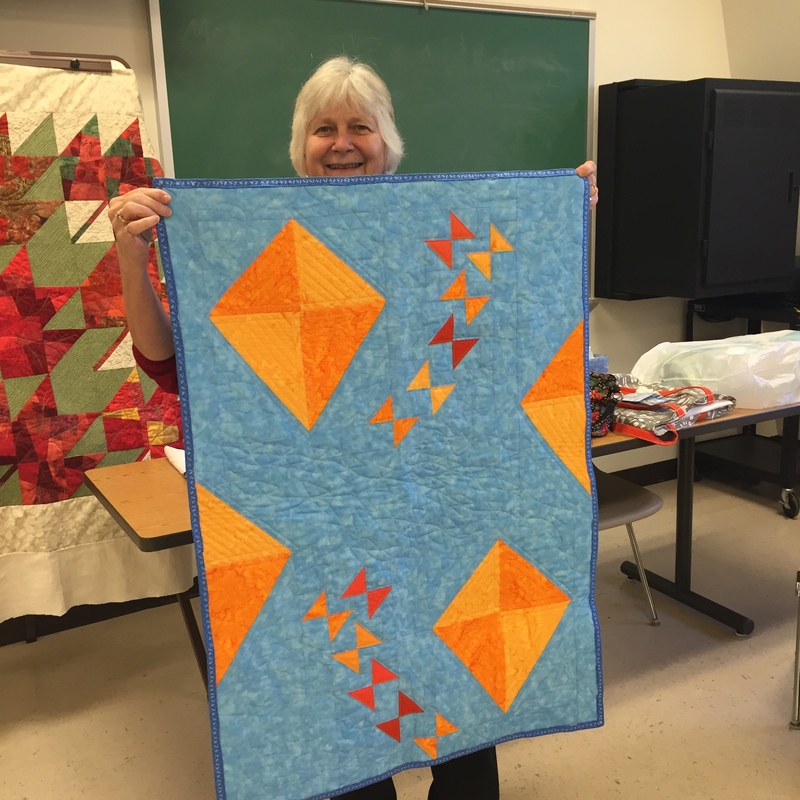 And we had a lot of fun seeing all the favorite tools and gadgets for quilting that members shared. 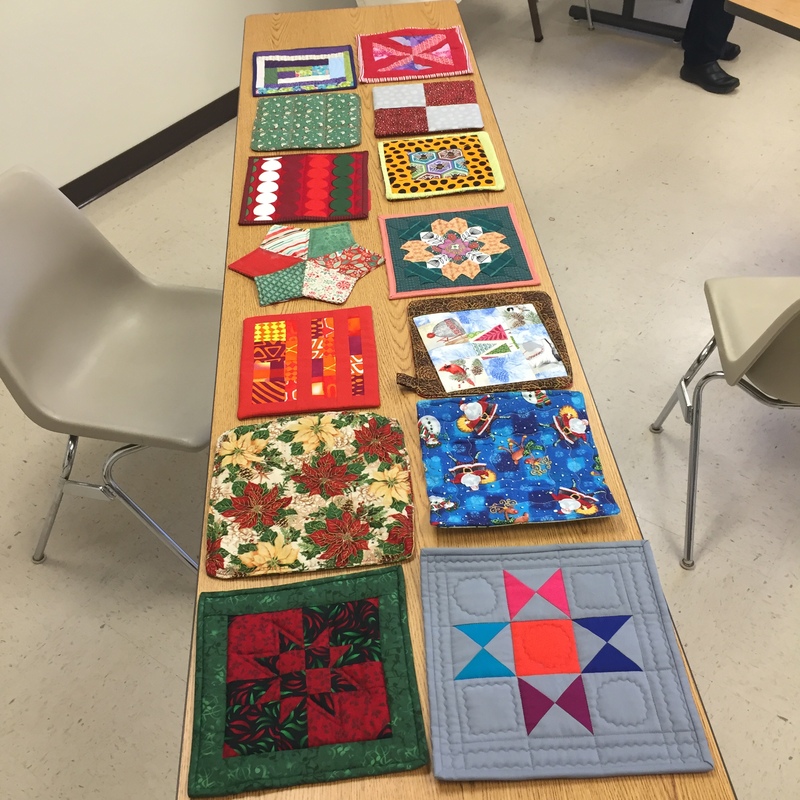 We only had a few people with items for Show and Tell, but they were beautiful nonetheless. 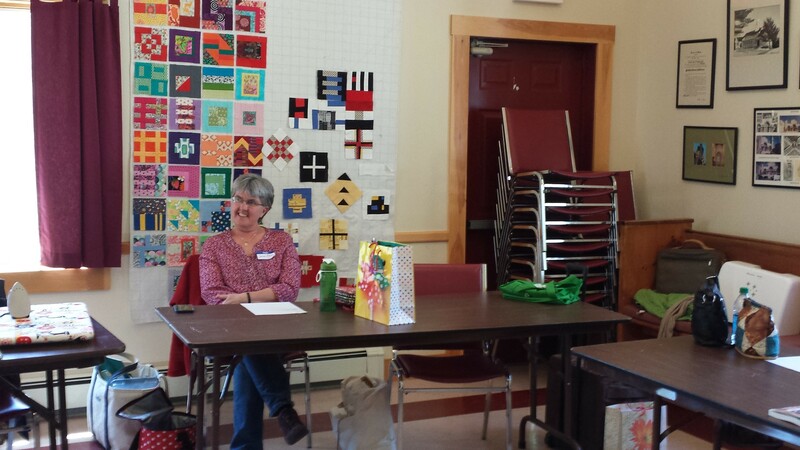 We had our Holiday meeting at a beautiful church hall in New Gloucester. It was very festive with lots of great food, great decorations, great activities and great people! 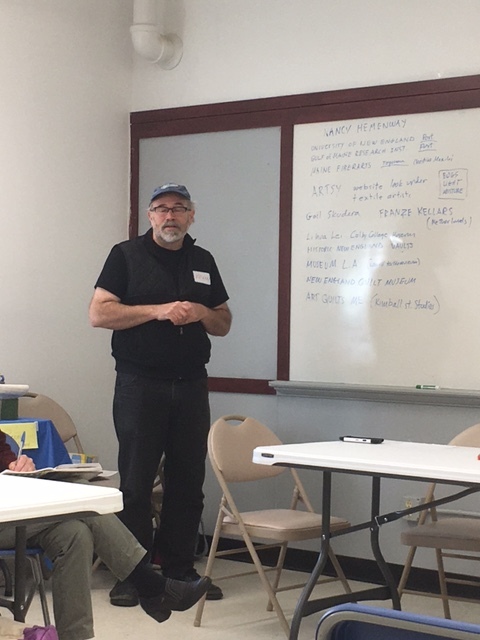 Our meeting this month was held in Clinton at a wonderful Ironworkers Hall with lots of space and great natural light. 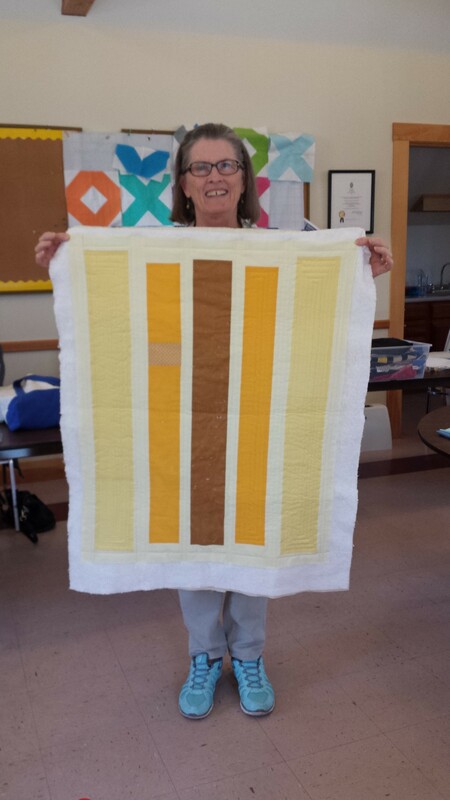 It was a small but enthusiastic group where we learned the Quilt As You Go technique from Jane. 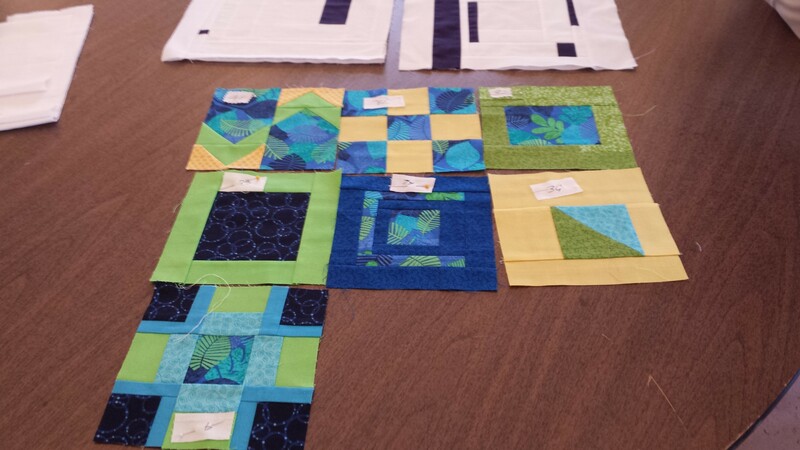 Block of the Month blocks we shown by Sandy and Carmen. 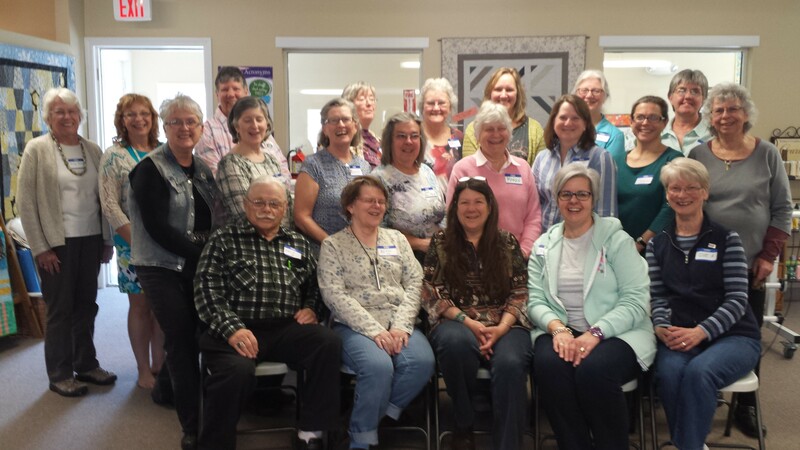 It was a lovely spring day to drive out to St. Giles in Jefferson for our meeting. 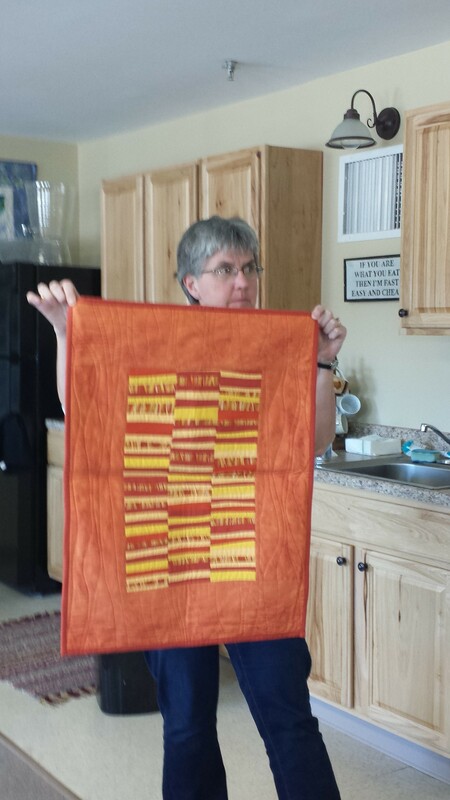 Thanks to Hazel and her pastor of St. Giles for allowing us to gather at such a comfortable and creative place. 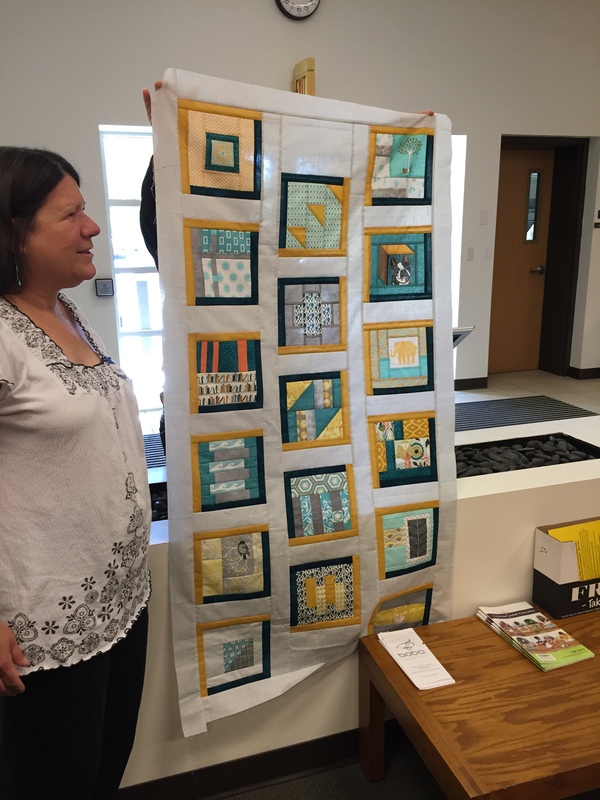 The block of the month was tea-leaf made modern and we had many inspiring versions of this traditional block. 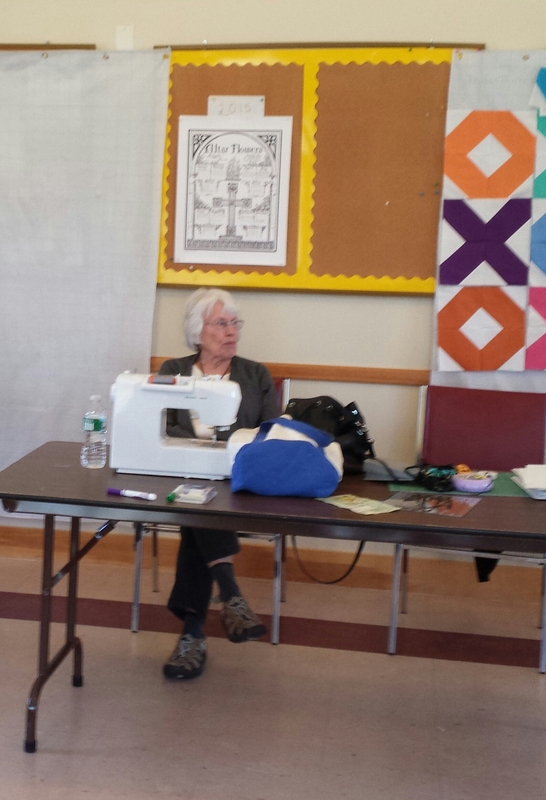 Jennifer and Sue A did an outstanding job of teaching us 2 techniques for sewing circles. 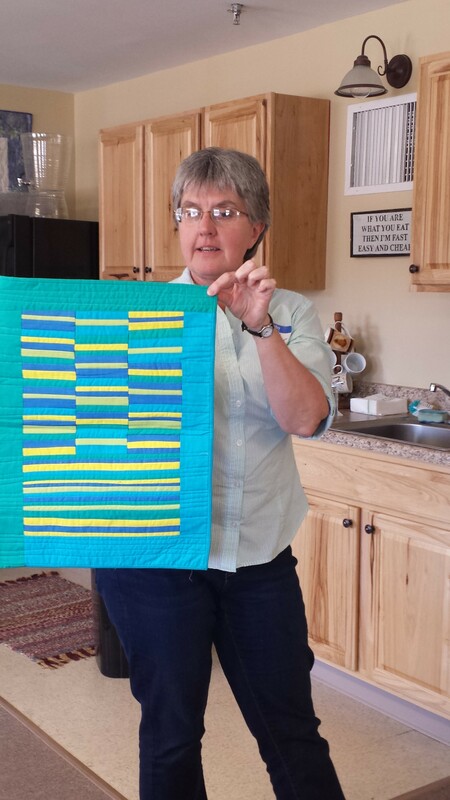 We even had a chance to practice some free-motion quilting of circles. Circles, circles and more circles! 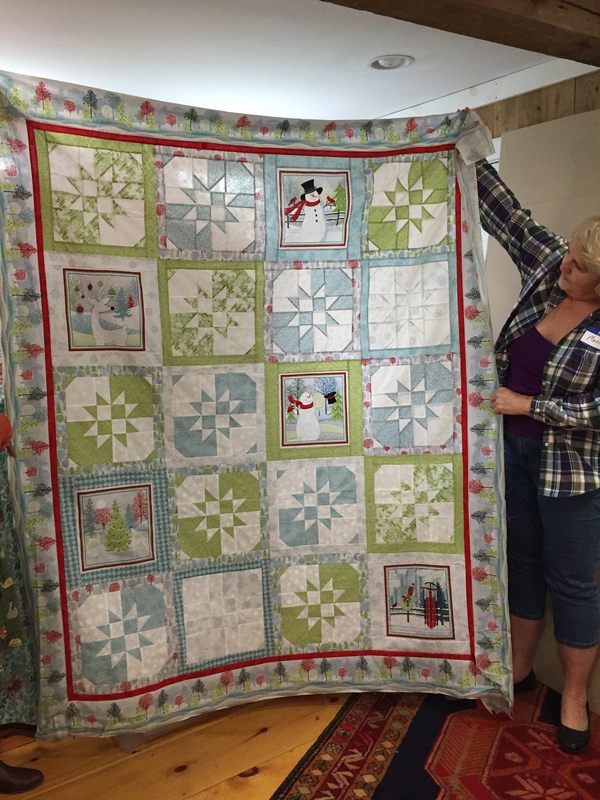 The quilts for show and tell were beautiful as always! It was a lovely, sunny but chilly day for the meeting. We were a somewhat small but very creative group! 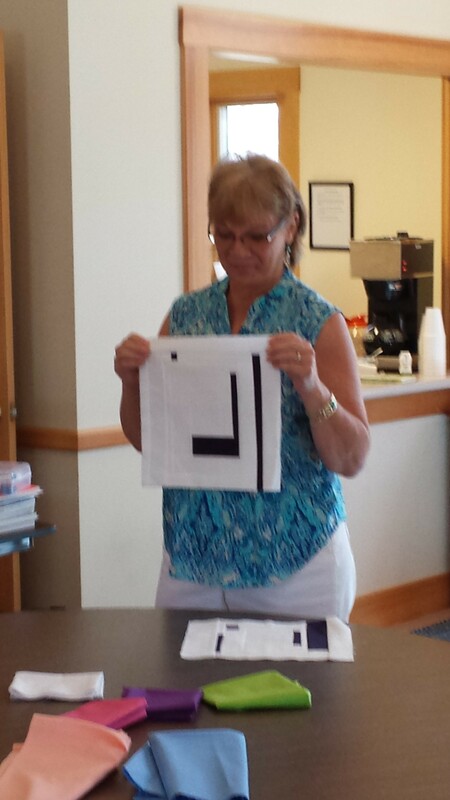 Jane taught us a unique way to do a fabric nametag. 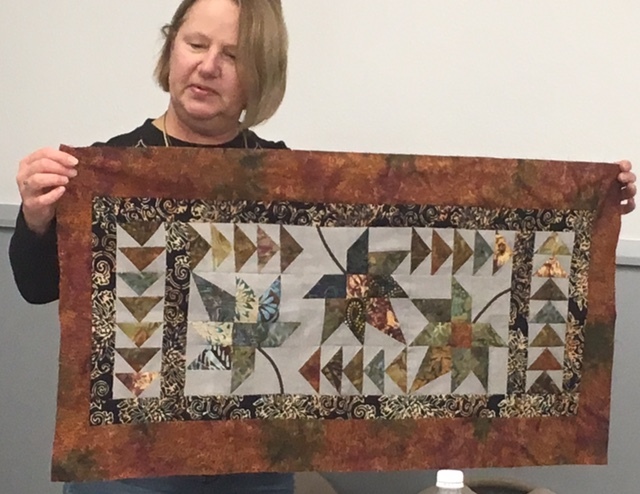 Carmen did a workshop using Tula Pink’s Tubular Piecing Process. 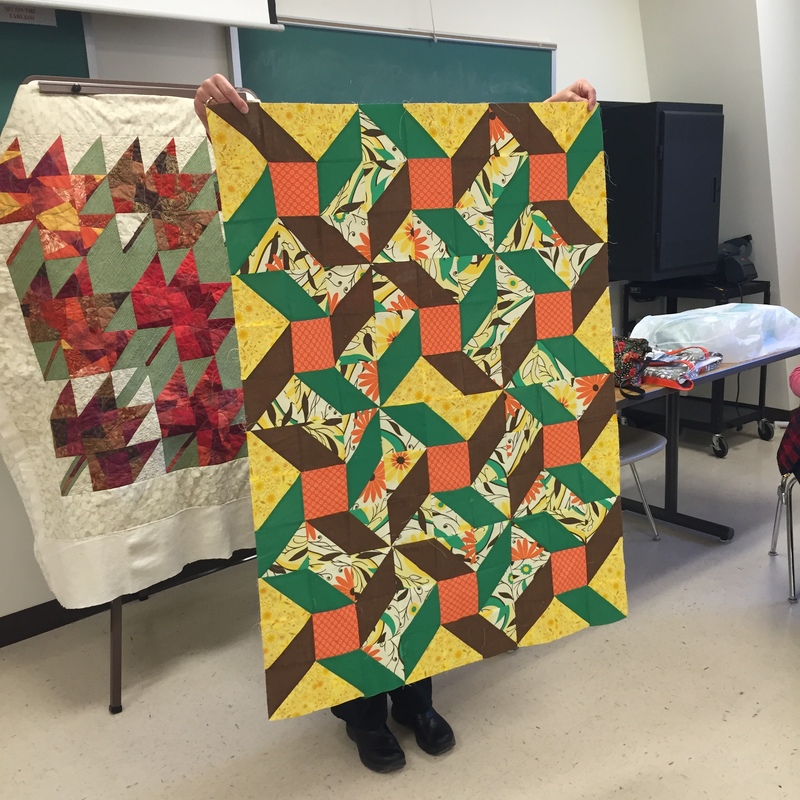 We learned 3 tube techiques and a way to sew a facing on to a quilt instead of a binding. Very informative! All members will receive an email with the details of this meeting and what to expect for the upcoming meetings. 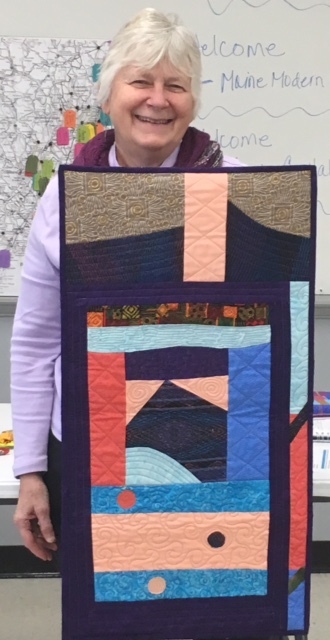 Congratulations to Kathryn Simel for the ribbon she received for her quilt that was shown at QuiltCon 2016. 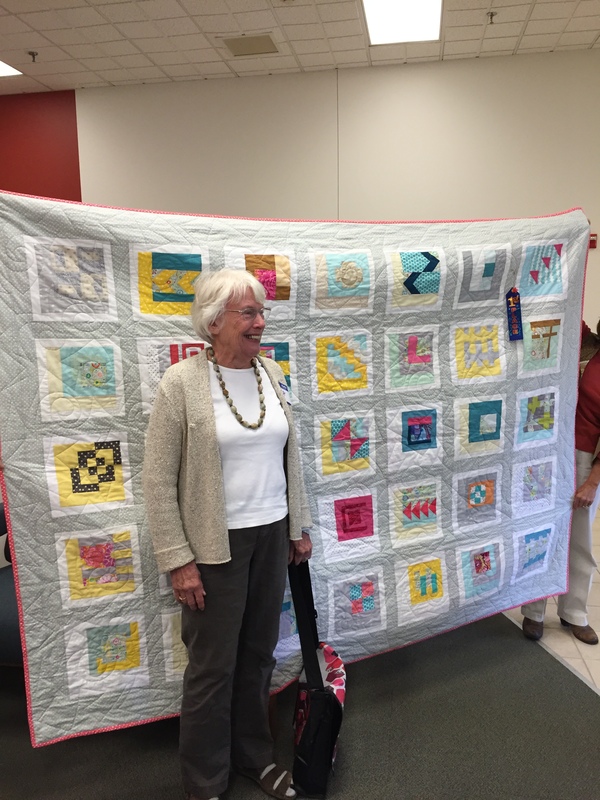 She received Third Place for the Use of Negative Space for her quilt entitled, Catching Up. It was wonderful to see it in person! 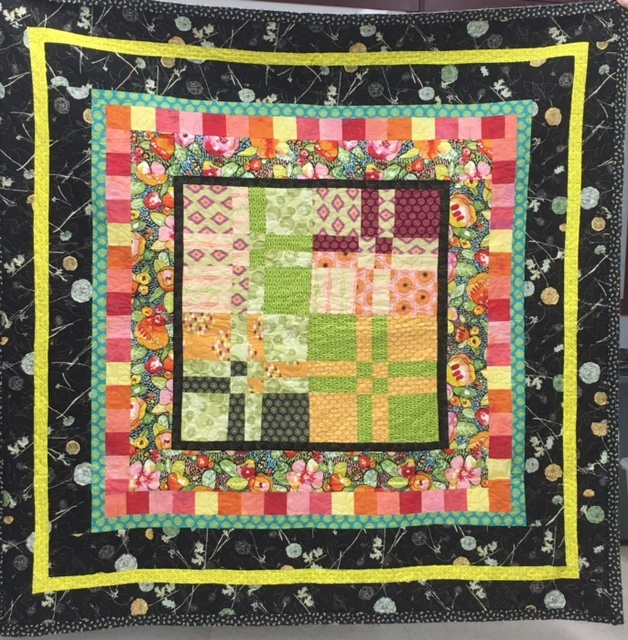 And more kudos go out to Kathryn because she will have a baby quilt version of another of her creations to be published in an upcoming edition of Modern Quilters Unlimited Magazine. Such creativity! Saturday, January 16 Canceled Due to Weather! 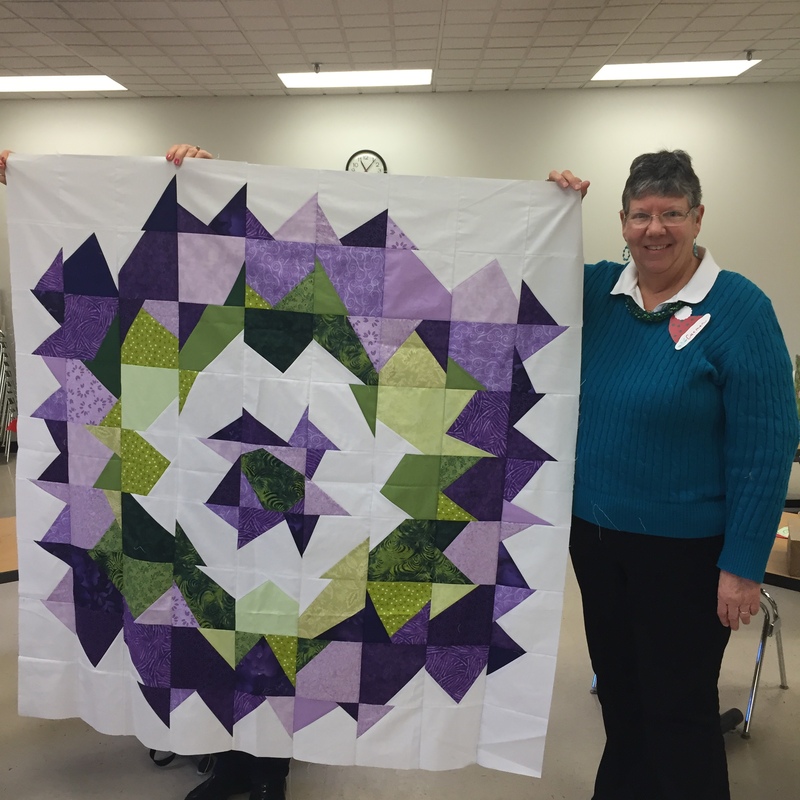 On Saturday, Dec. 5, the Maine Modern Quilters had a great holiday gathering! First off , was the passing of the presidential gavel from Betsy to Sharon. 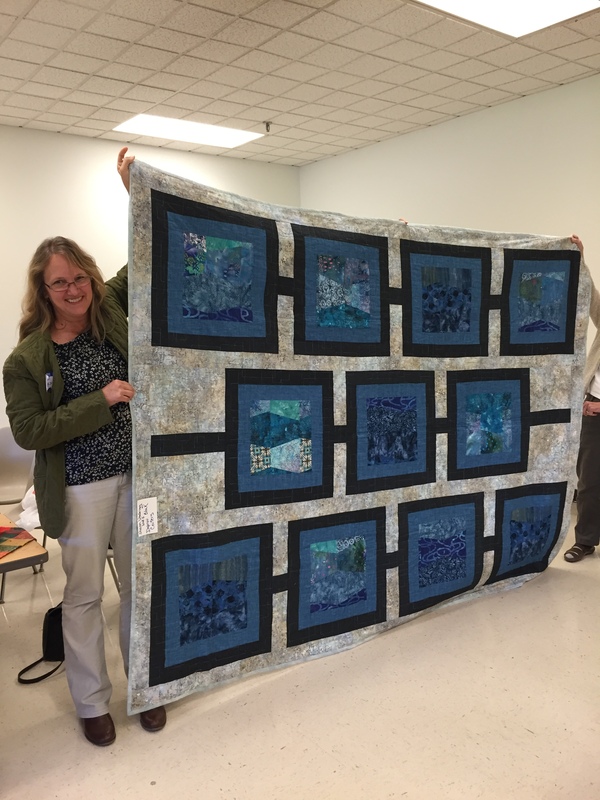 Thank you Betsy for your dedication to the formation of the group and service to Maine Modern Quilters! 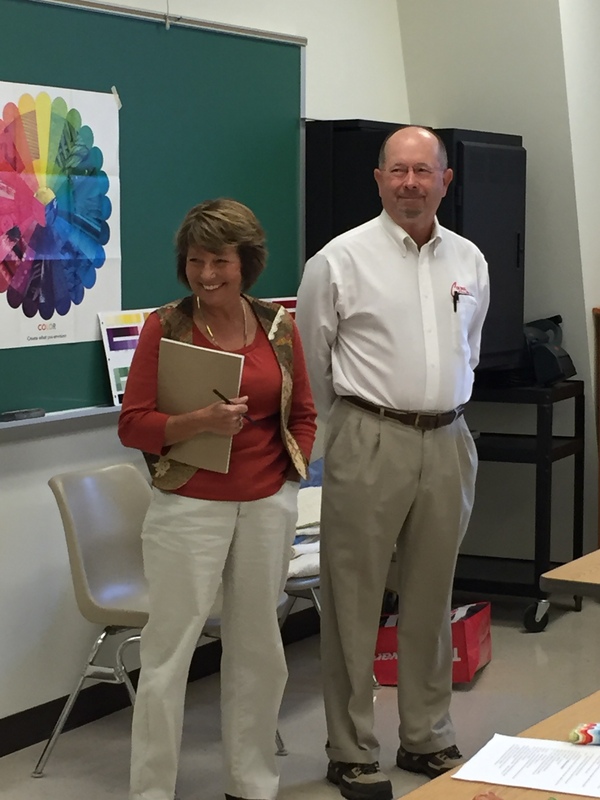 And good luck to Sharon in her new role as our fearless leader! 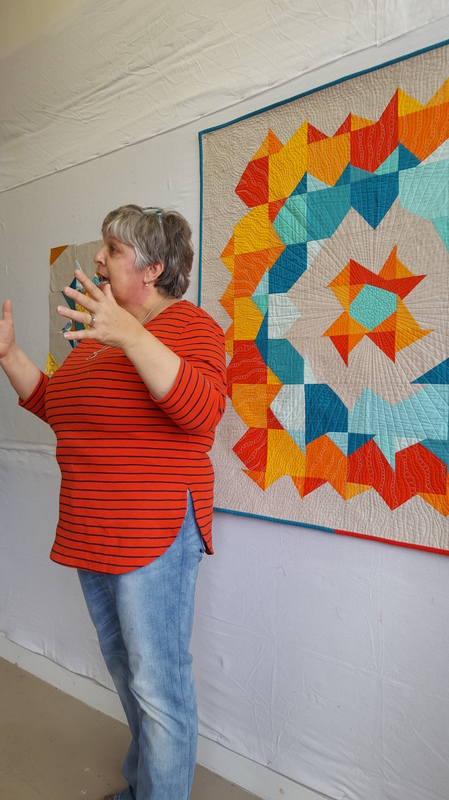 The morning was filled with silly little quilty games, a hot mat swap, yummy treats and as always, a beautiful show and tell. The members also made a generous donation to the Good Shepard Food Bank. Thanks to all who made this a memorable event! The gavel was passed from Betsy to Sharon. 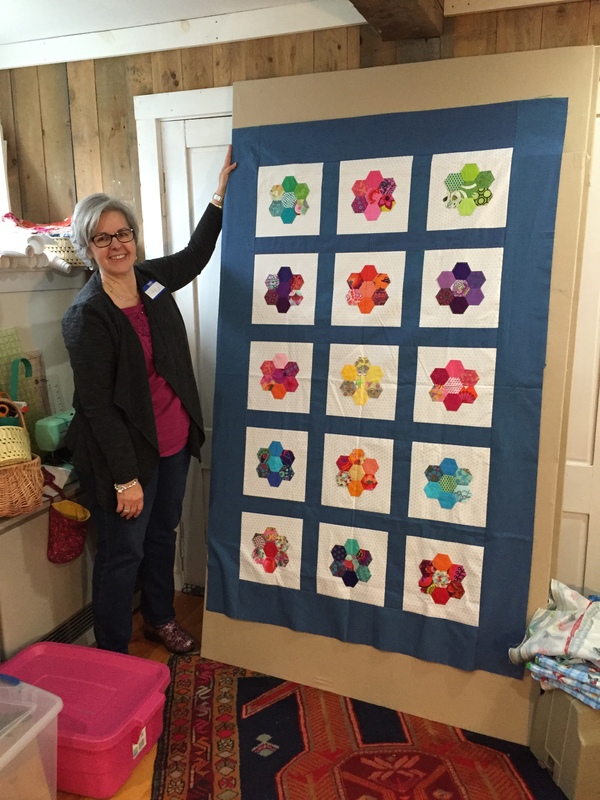 On October 5, 2015, Jacquie Gering taught a Supernova Technique class to our Maine Modern Quilters at A Gathering of Stitches in Portland. 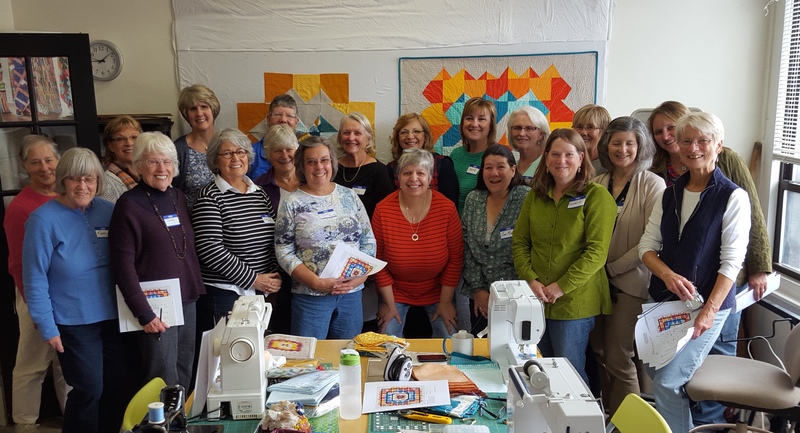 Jacquie is a world renowned modern quilter and we are so thrilled she came to Maine to give us this wonderful class. 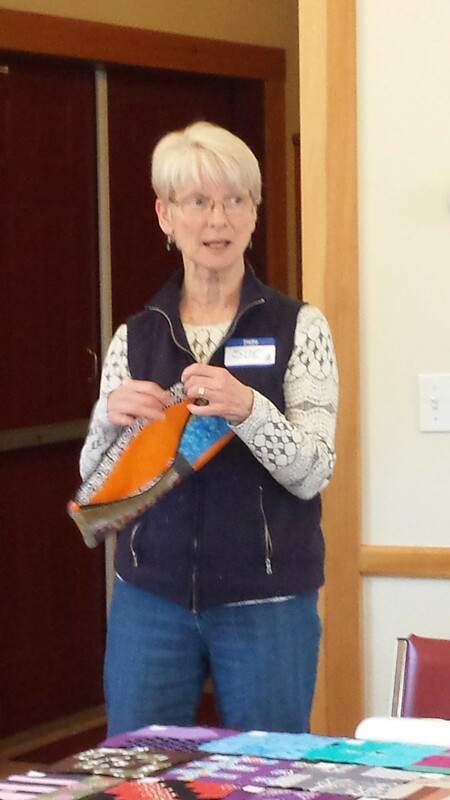 Sue Arnold showed a zippered bag, lined, with inside pockets, that she made from the Improv class we had on April 18th, taught by Bonnie Dwyer. 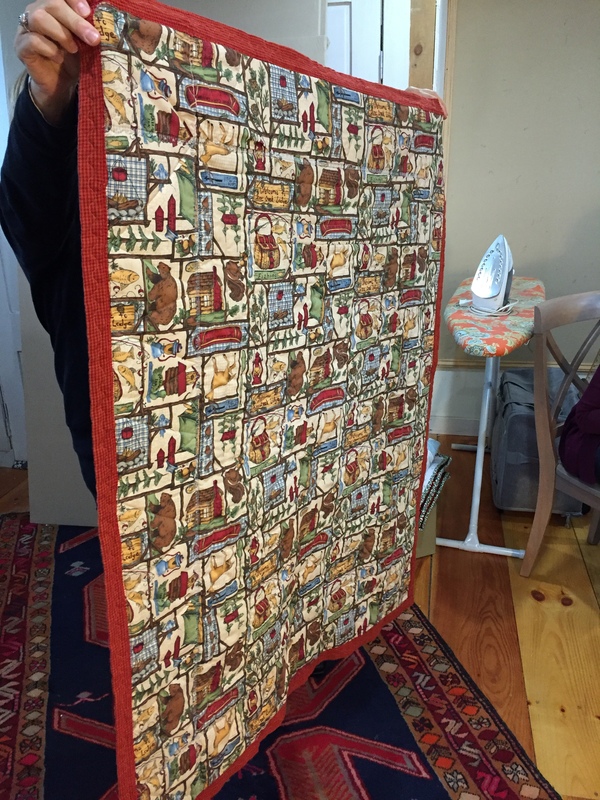 Tagged 1600" jelly roll quilt by Heirloom Creations, Improvisational Quilting. 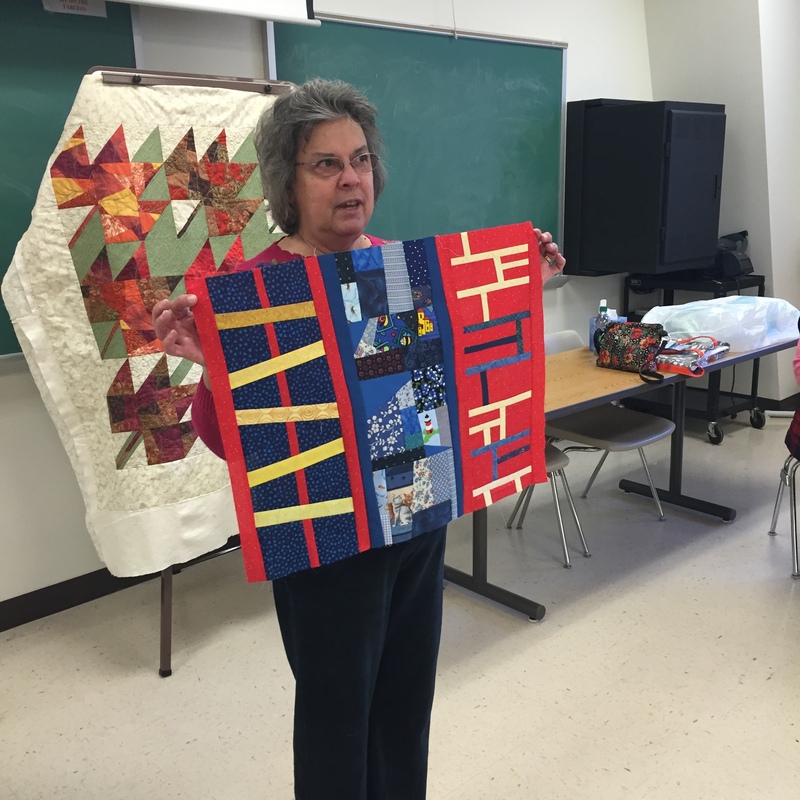 Hazel Henderson sewed up some blocks incorporating the design method her mother used to make blocks many years ago. 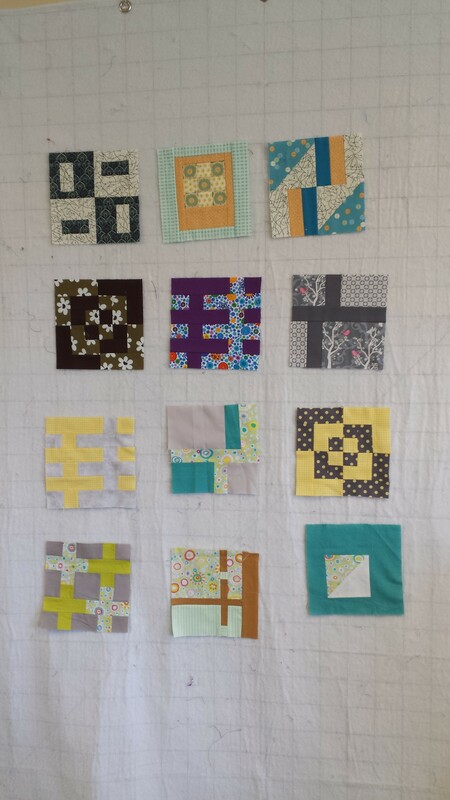 The blocks have a backing and color is random. 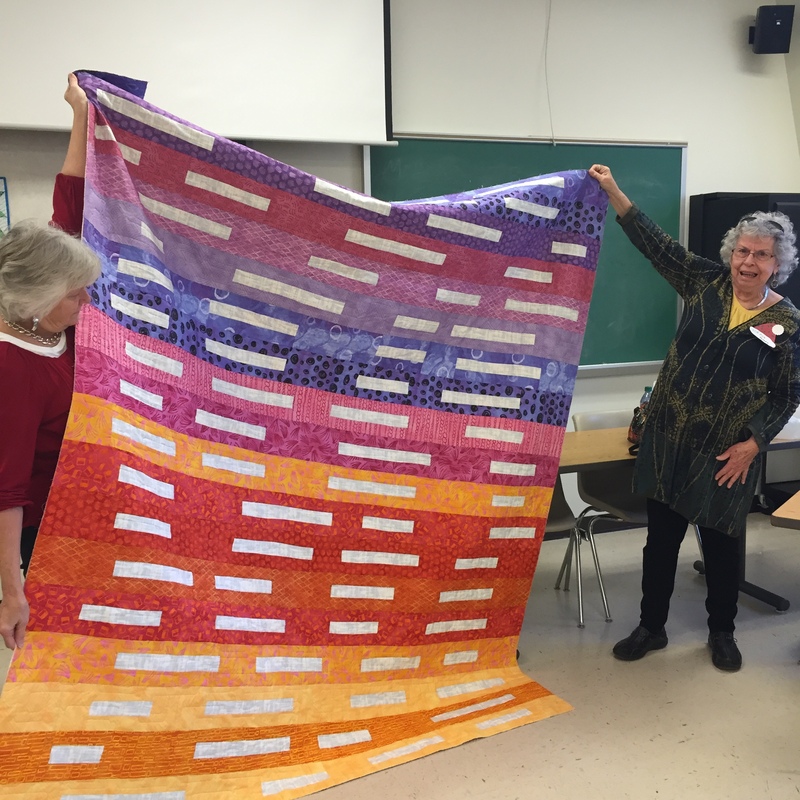 Cindy is leading a discussion designed by Ann-Marie Schetchman, “Getting to know you.” Sue Duval on the right is explaining a concept. 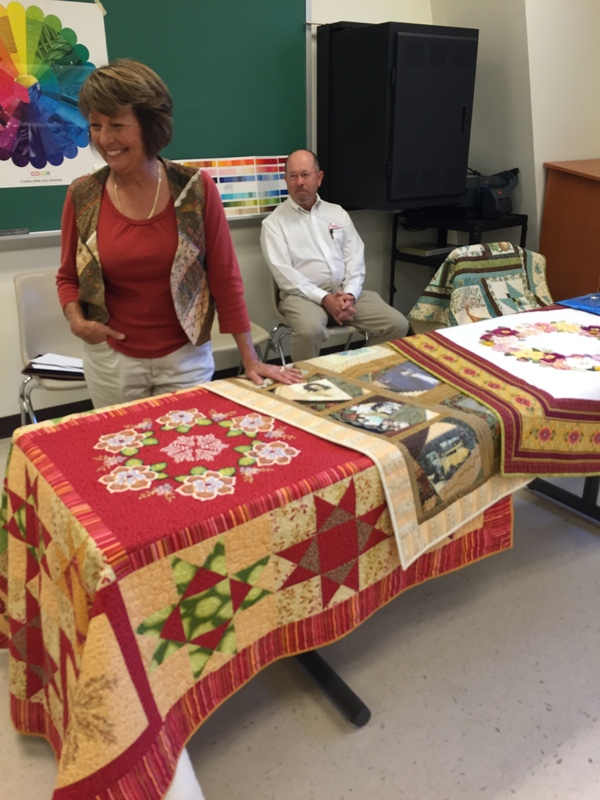 Jane Hann Morey and Bonnie Dwyer discuss quilting. 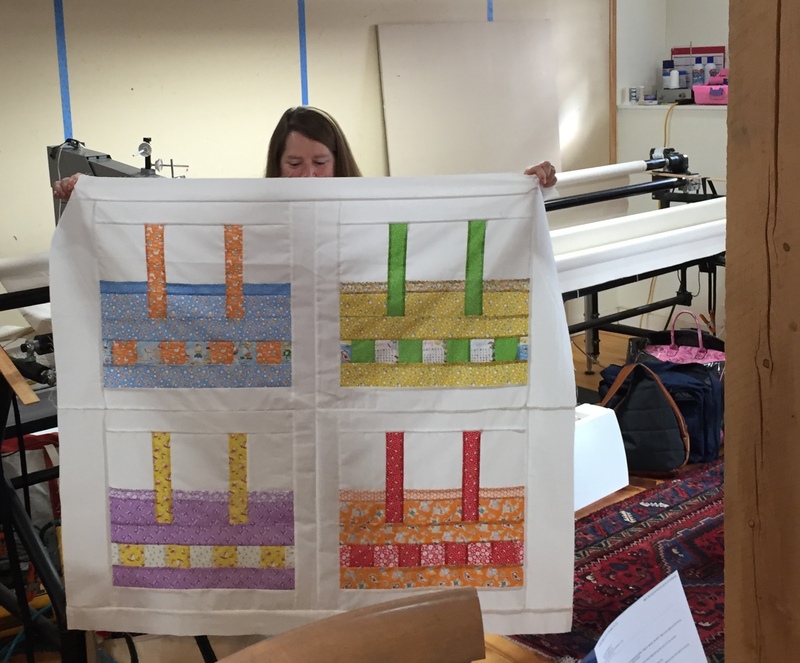 Jen first displays 2 self-designed quilts, each using only 5 fabrics. 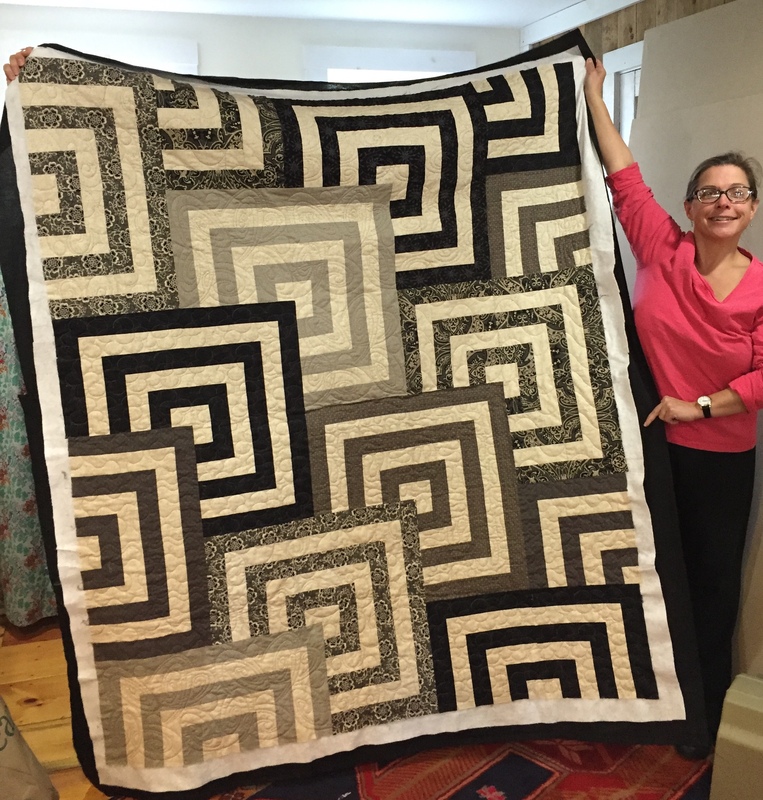 The next quilt is also self-designed and modern quilted by Jen. Beautiful, Jen! 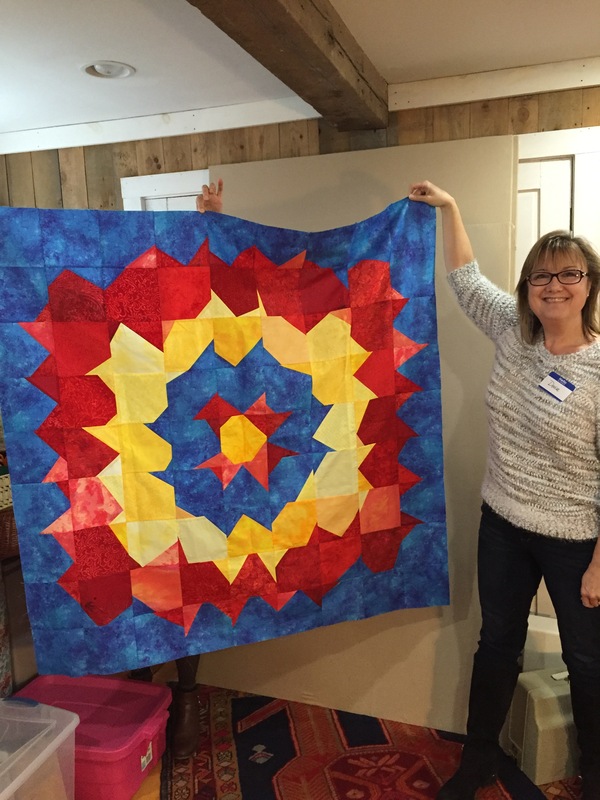 Glad you are back in Boothbay!